The red oval logo is back! I first spotted this display out on my last road trip and thought "Wow, that's an old display!" But then I saw another at the very next store I visited. Since then two other people have sent in pictures both thinking they've stumbled upon a relic of the past. Figured I would get the pictures posted before anymore came it. 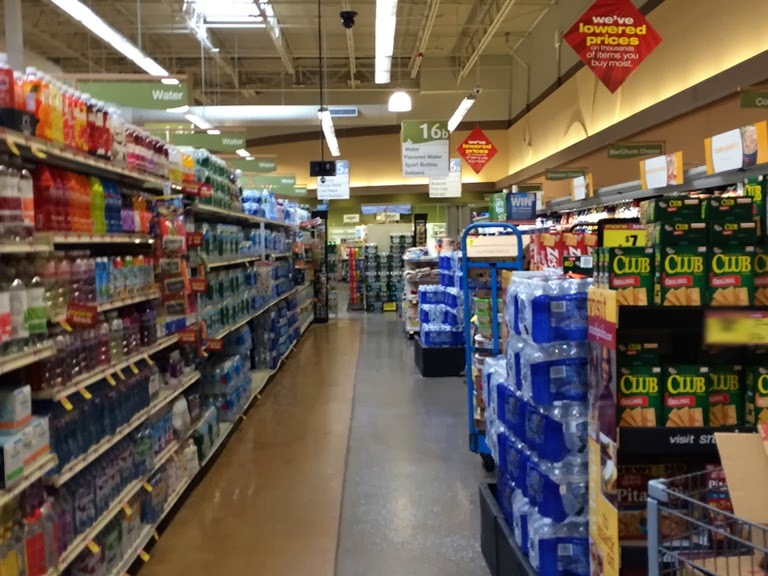 The first picture is the one I took at a store that will be featured in an upcoming post. 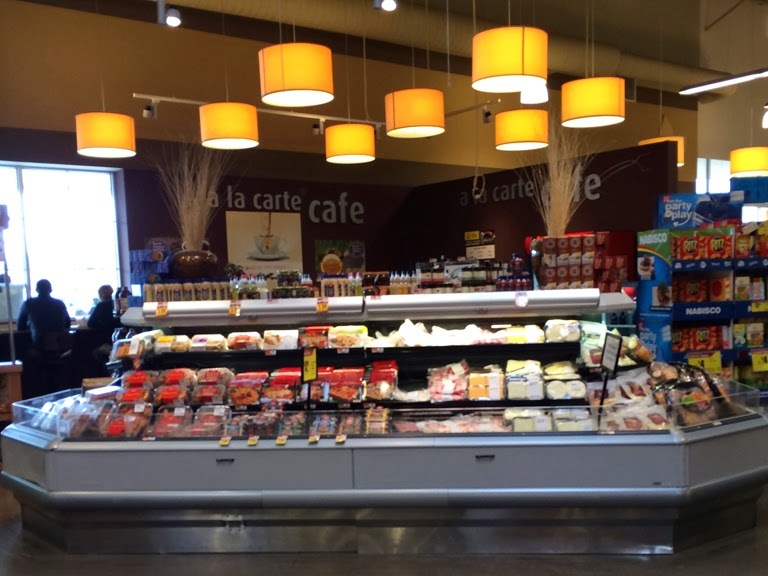 The next two were taken by Erica at the Woodbury store with the very last picture from the Exton store sent in by @. 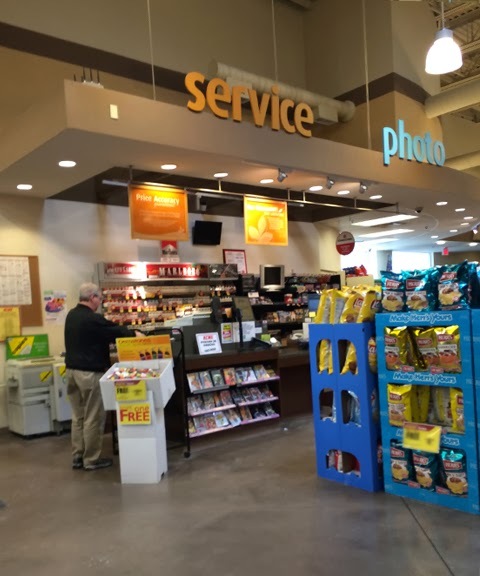 The two pictures above courtesy of Erica R.
Now that we've made the rounds to the two stores that closed this week, let's switch gears and move onto a successful, stunningly beautiful Acme. 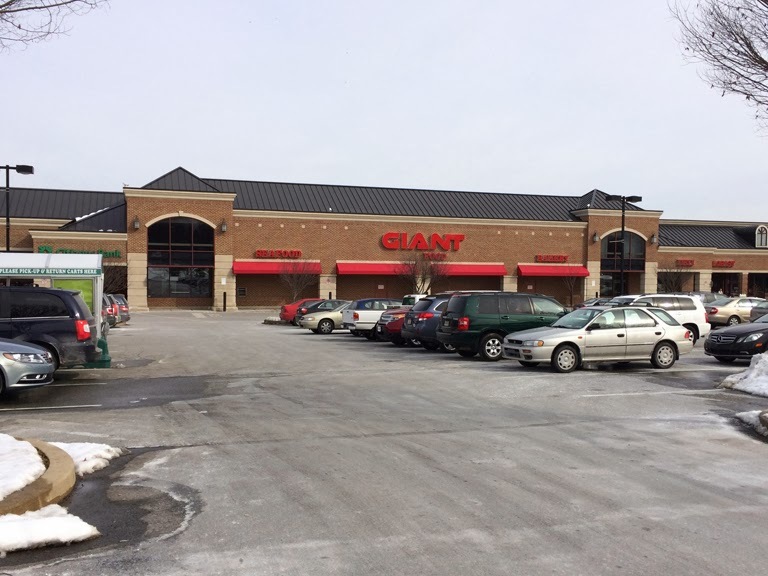 The Glen Mills store is one of the newest stores in the whole chain, opening on April 25, 2008. 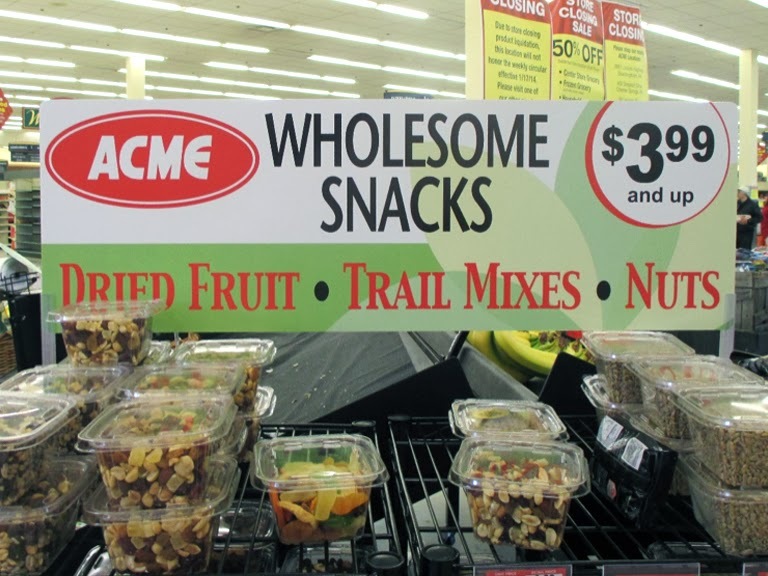 At the time, Acme touted it as the Philadelphia area's most environmentally friendly store. 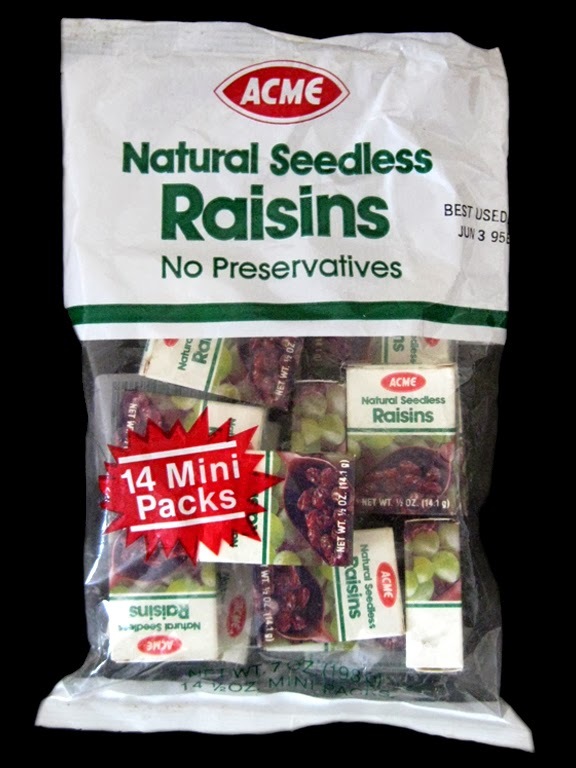 Former President Judy Spires will tell you all about it in an article over at SupermarketNews.com. 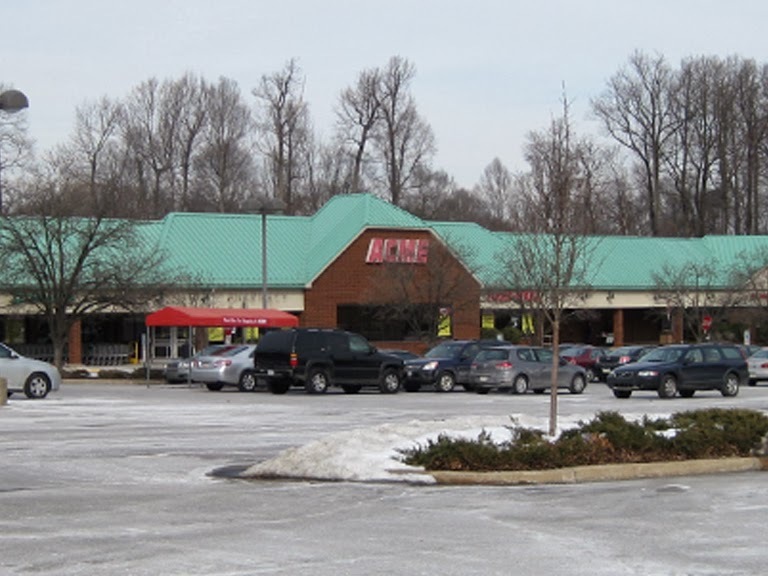 While several new stores of the 2000's failed to catch on, Glen Mills appears to be doing pretty good business... for now. 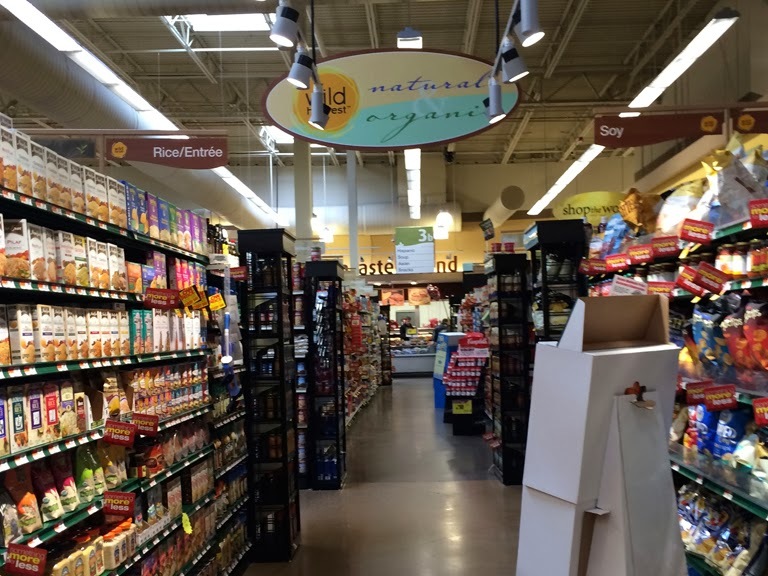 Wegmans is nearing final approval to build a store close by. 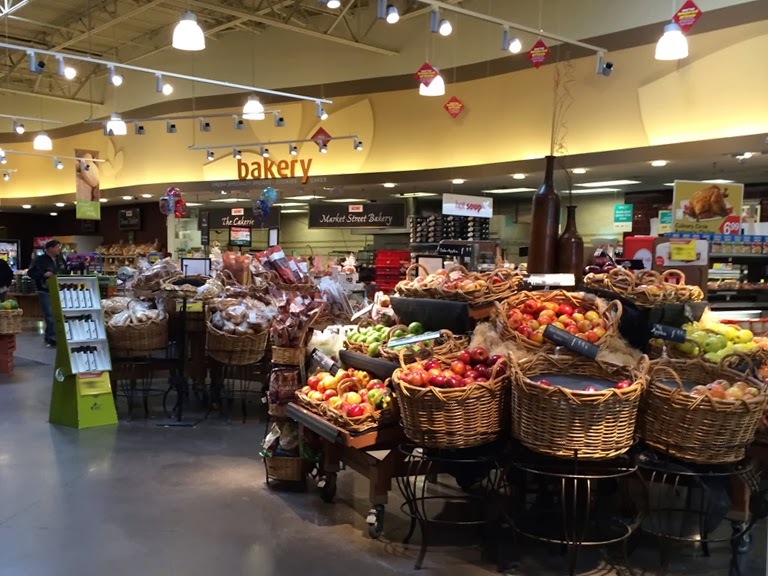 This location was among four new "Premium Fresh and Healthy" stores opened during the SuperValu years. 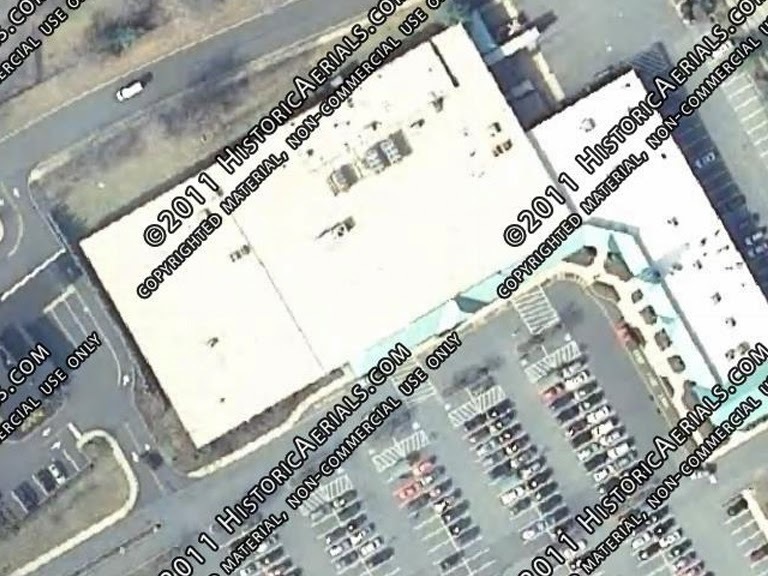 They include Avondale (if you jump over, scroll down below the Kennet Square pictures), Bordentown (the new store coming to the blog soon) and the doomed Limerick store (long closed and abandoned). 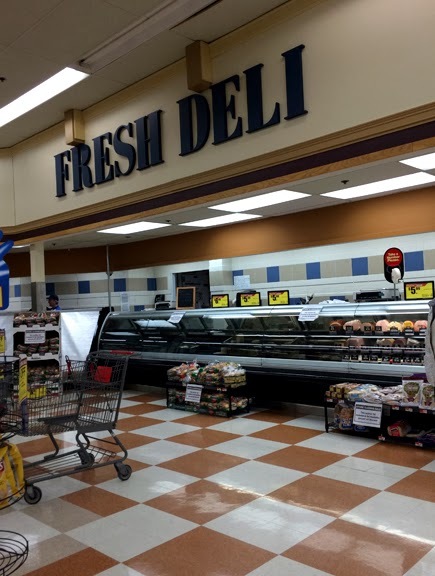 All four locations received the original Premium Fresh and Healthy decor package, with Glen Mills getting a much needed injection of color. 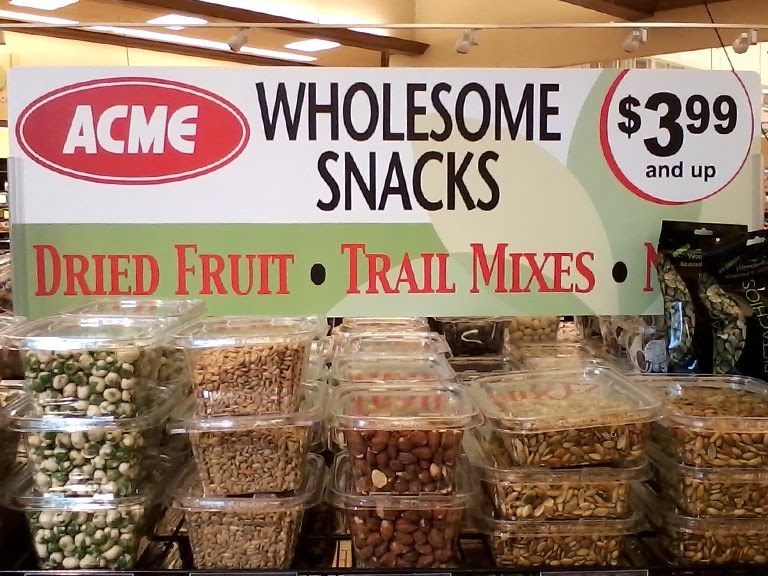 This decor package was rolled out to existing stores as well. 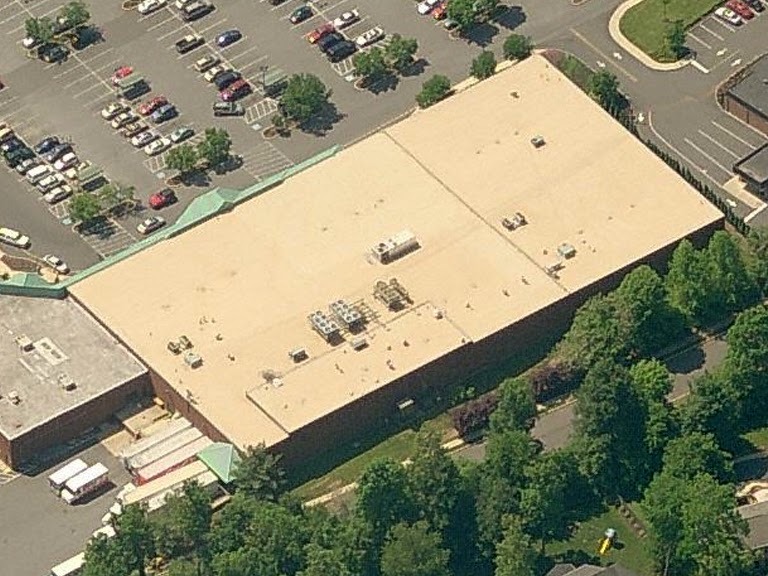 Locations like Feasterville, Burlington and Wilmington/Naamans Rd received the original floor to ceiling package, which was relatively short lived, I'm guessing due to the cost. 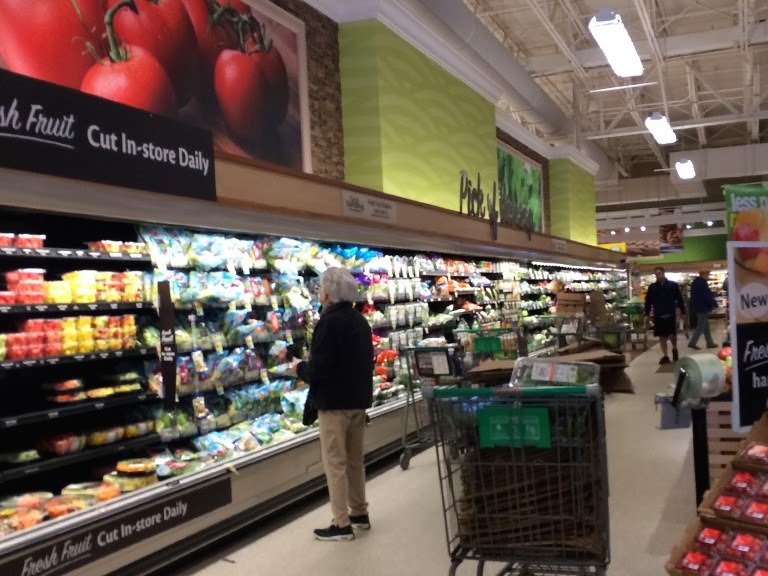 A simplified version, using colors similar to what is seen in Glen Mills, wound up being rolled out for most of the remodels. 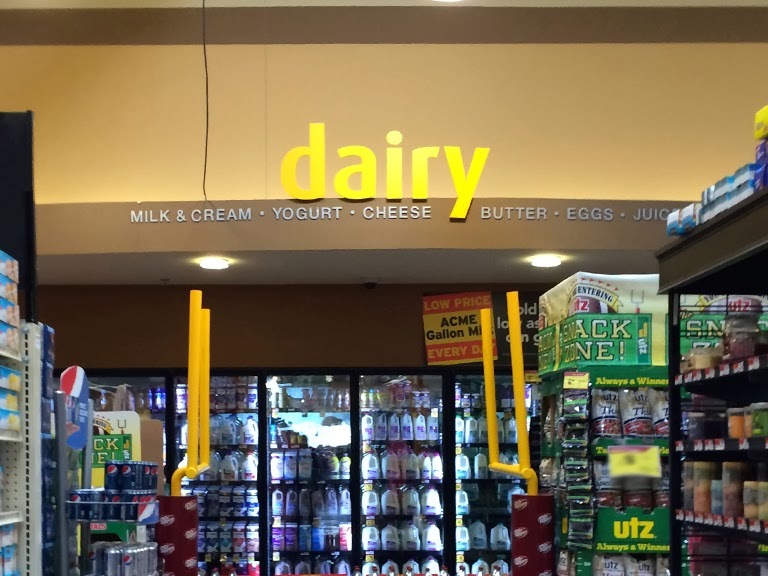 This newer package ditched the gigantic Albertsons leaves in favor of much smaller ones and took the elegant backlit department letters and stuck them to the walls. We'll take a closer look at one of these remodels in a future post. 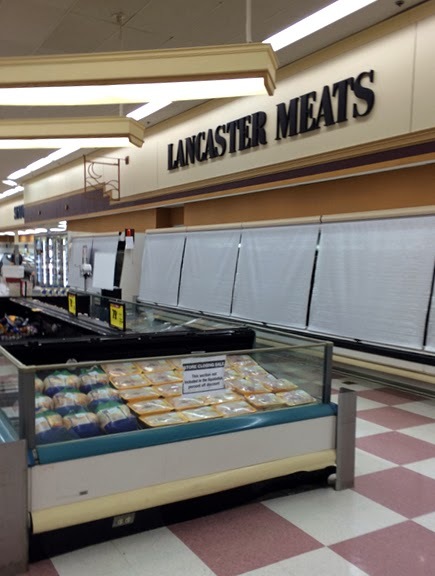 The only other store to open since the four mentioned above is the one in Bryn Mawr. 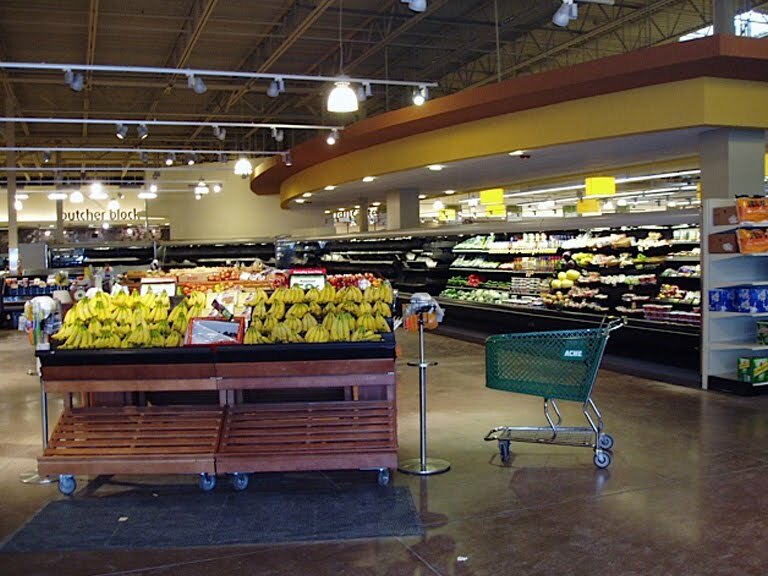 That store was destined for success as it replaced a well established older model. 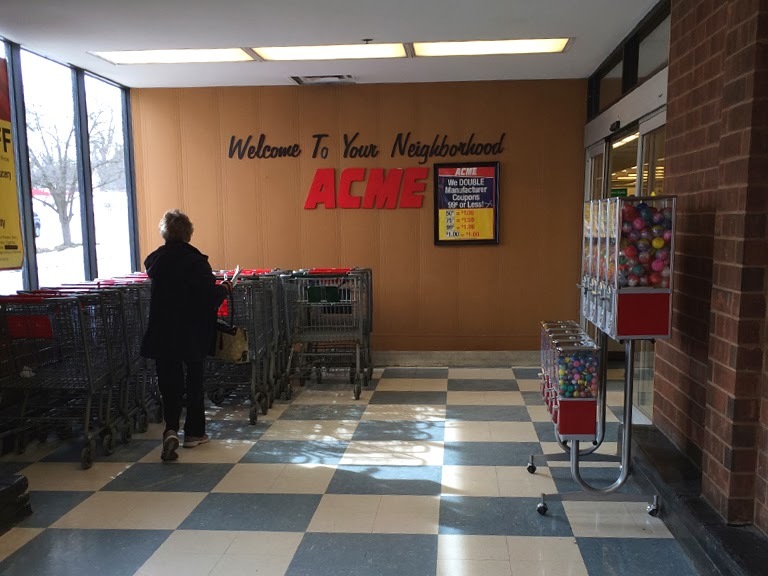 Acme refers to Bryn Mawr as their "flagship"store. I think their flagship store is right here. 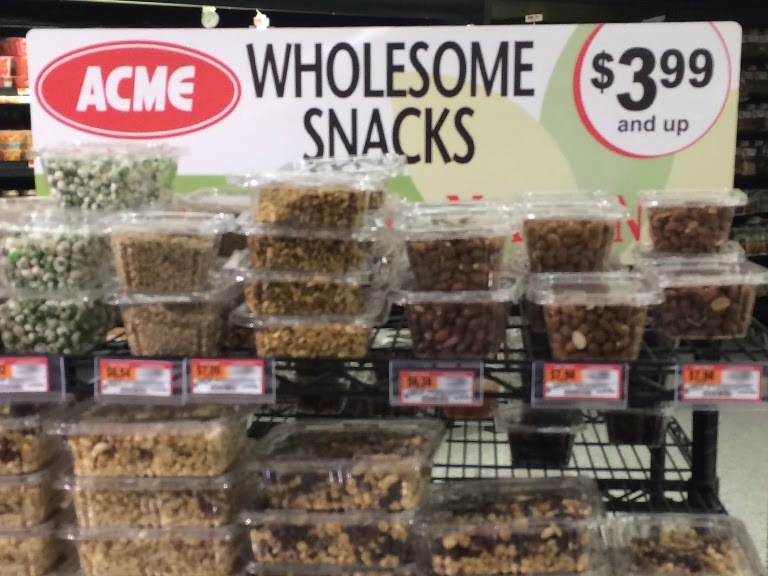 Even the exterior here is among Acme's best! 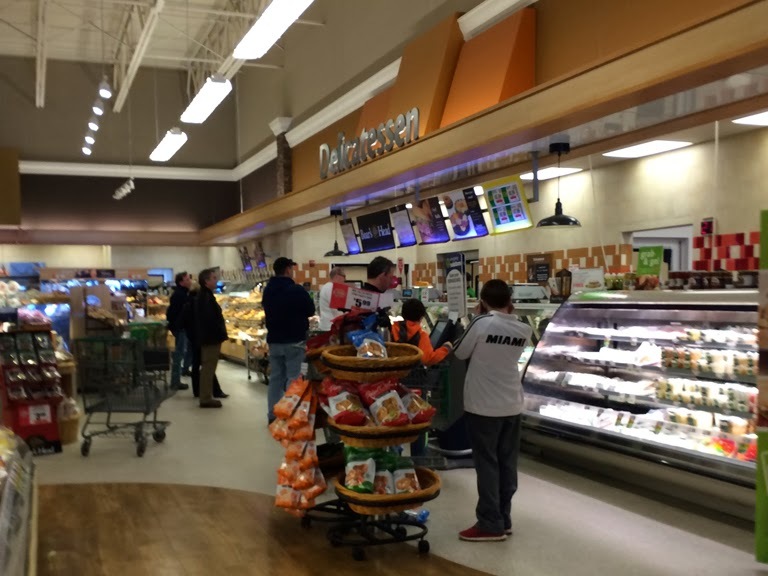 As I mentioned in the Westtown post, I was pretty shocked to see how busy this store was. 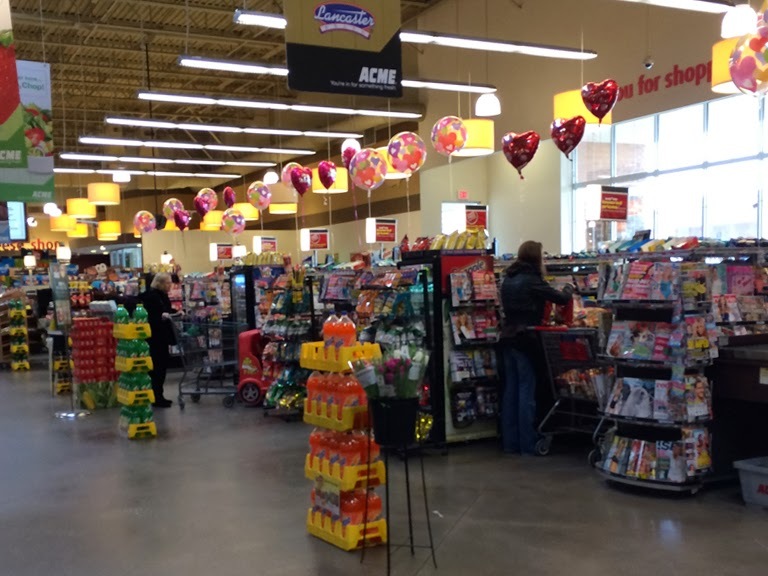 Ceratinly one of the busiest Acmes I've been to. This Acme goes by 2 names, which is not uncommon. 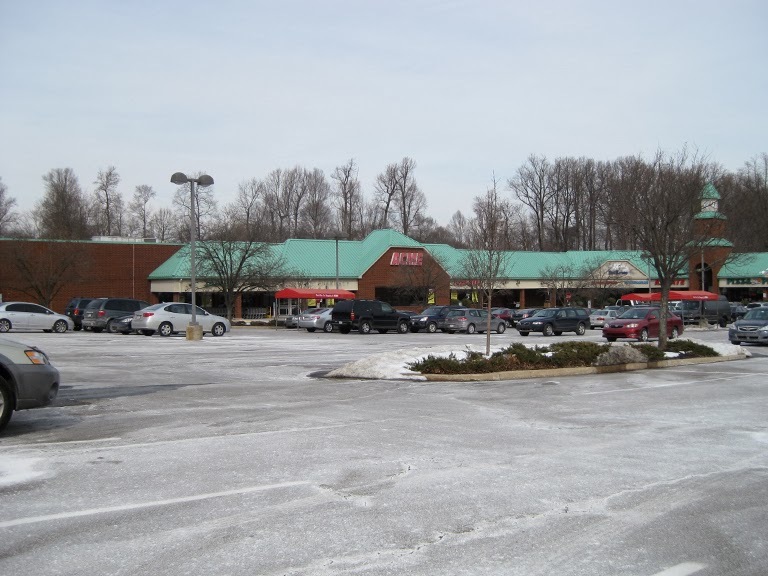 While the address here is officially Glen Mills, the shopping center is called Concordville Town Centre. Absolutely beautiful inside! 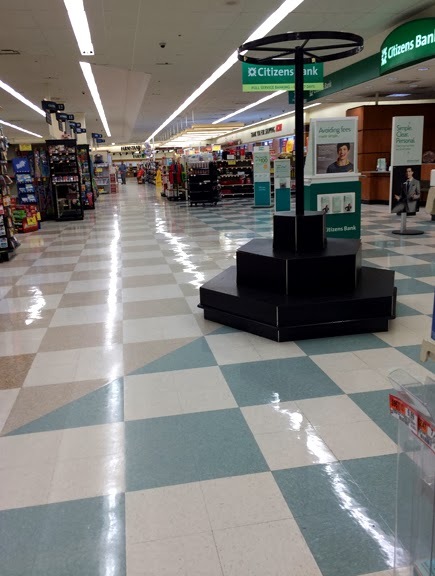 Nice attention given to the lighting in this area of the store. 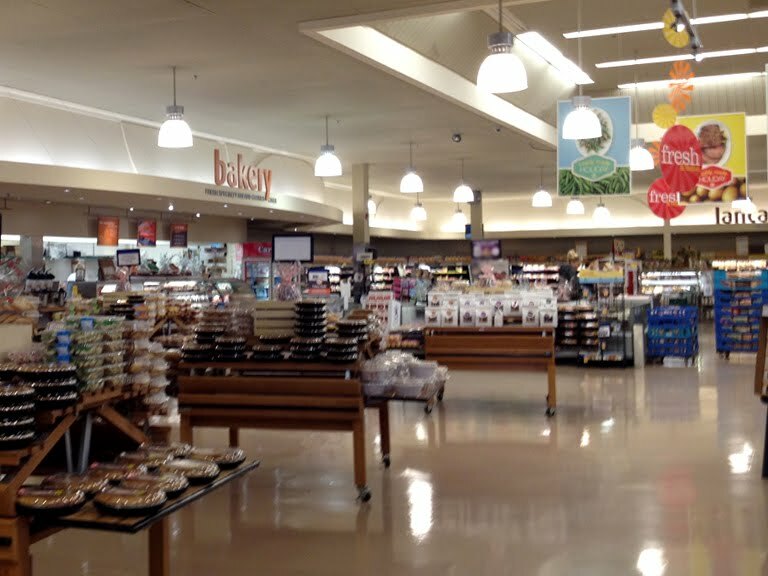 While it does have the same exposed ceilings as the the Albertsons Marketplace model, it doesn't have that awful, cavernous warehouse feel to it. 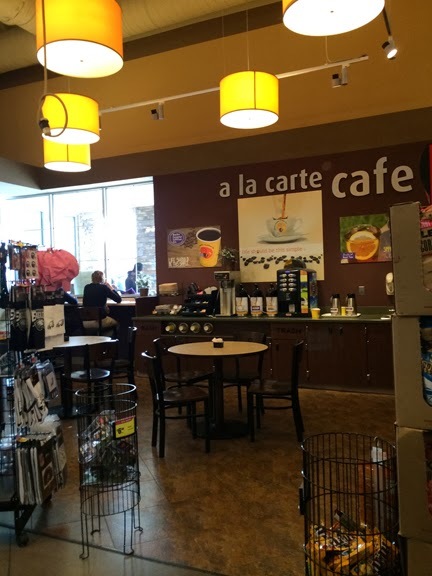 Turning around here and looking back towards the entrance… we have an a la carte case with a "cafe" in the front corner… which is nothing more than a seating area with some self-service coffee urns. A closer look at the cafe. 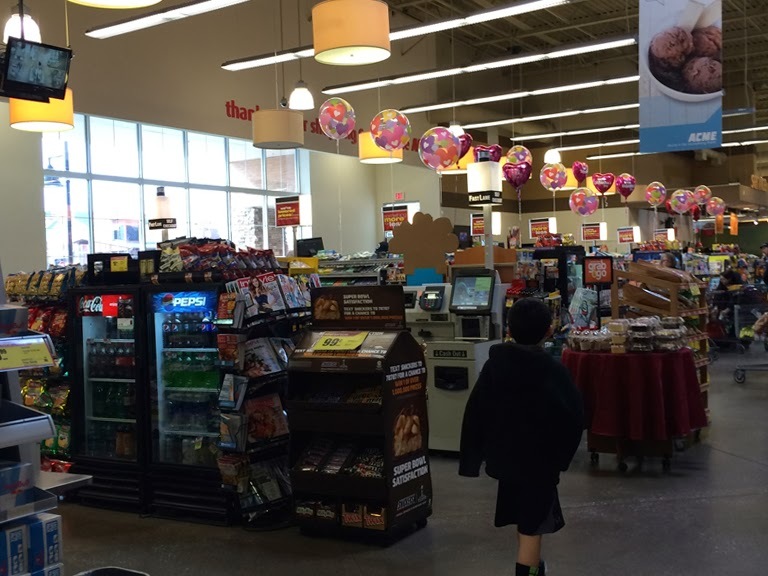 As I've mentioned in other posts, I'm a huge fan of the drum pendant lights seen often in Premium Fresh and Healthy stores. Only problem is… they're difficult to keep clean. 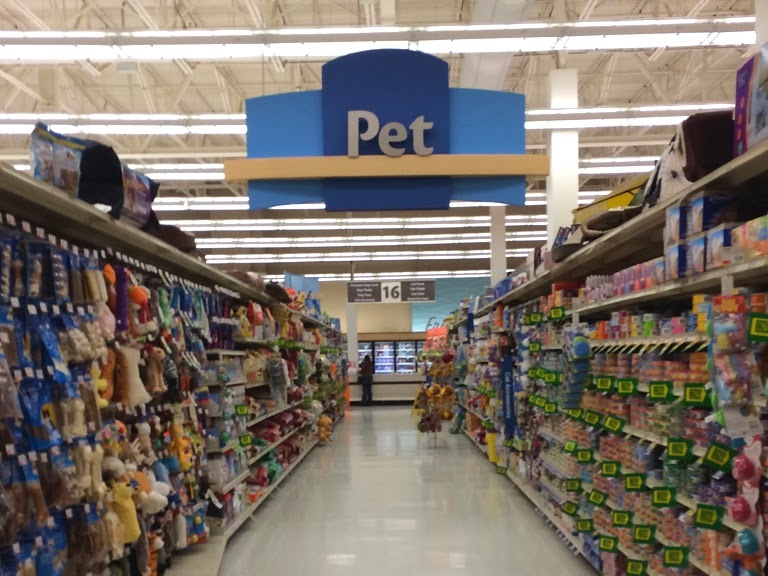 This store is doing an impressive job maintaining them. 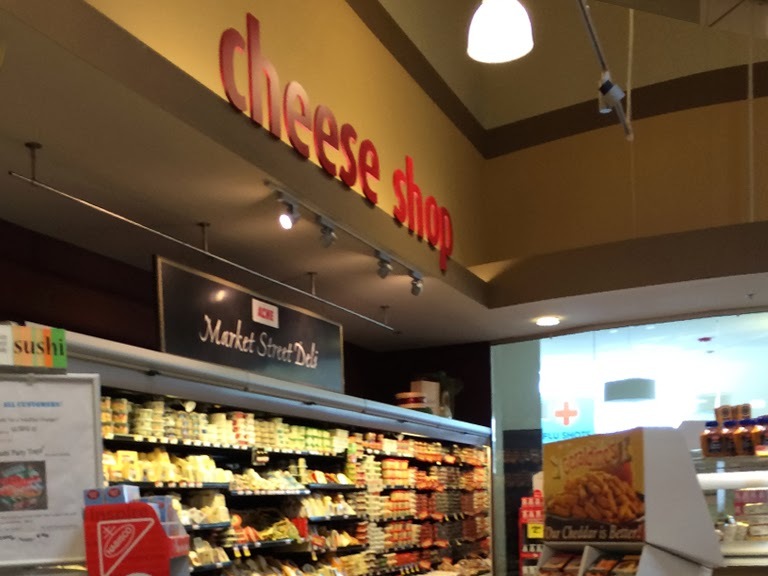 Cheese shop is in the front corner to the right of the entrance. If you follow this blog regularly you know I do my best to keep interior shots as people-free as possible. 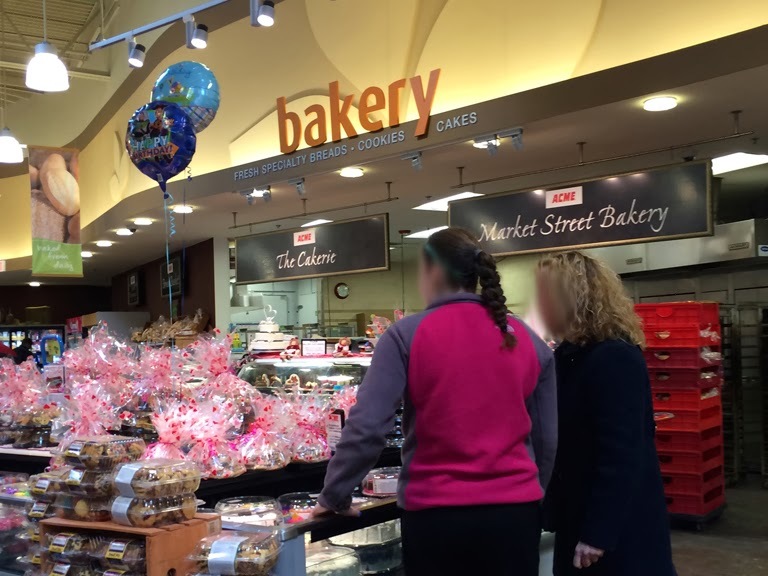 These two shoppers were winding up in every shot I was taking around the Bakery. Finally gave up trying to lose them. 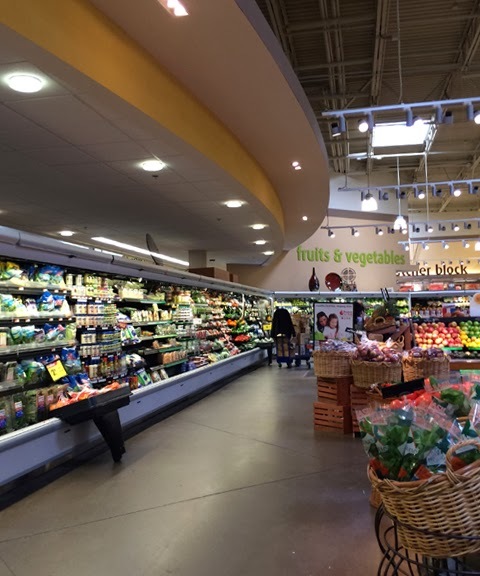 Cool curved ceiling over the produce cases. Limerick had an identical setup which you can see a better view by clicking here. 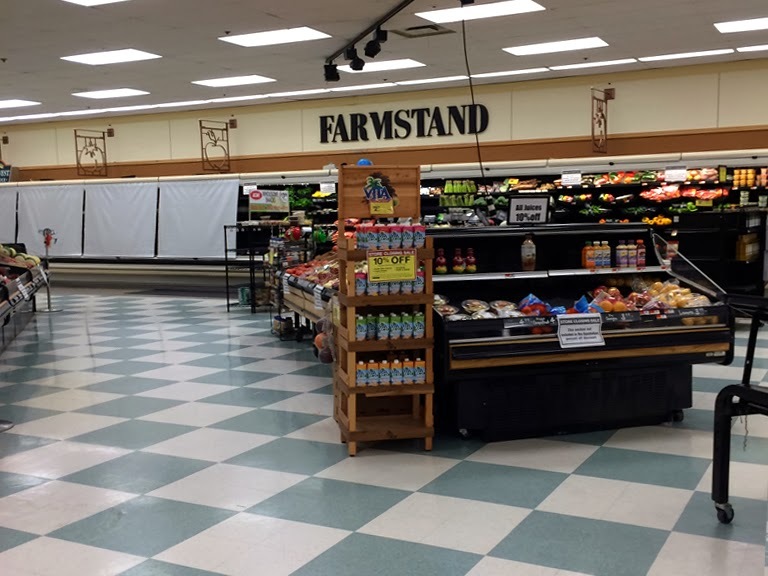 This drop ceiling extends over to the Wild Harvest Department. Looking towards to front. Notice the gold and brown color scheme. A nice change from the cream color of the original PF&H decor package. You can take a look at some examples by clicking here and here. The wall colors here give this store very nice ambiance. Bright lighting here throughout which is can't be said for either Avondale and Bordentown. I found both of those stores to be quite dark and gloomy. 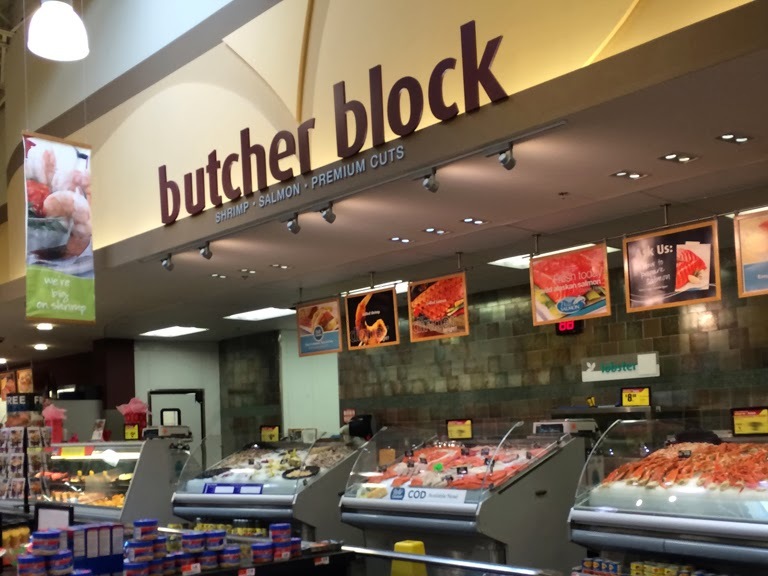 Meat Department located in the back corner. Love the backlit letters which are no longer being used in remodels. So here we are on the other side of the produce wall. 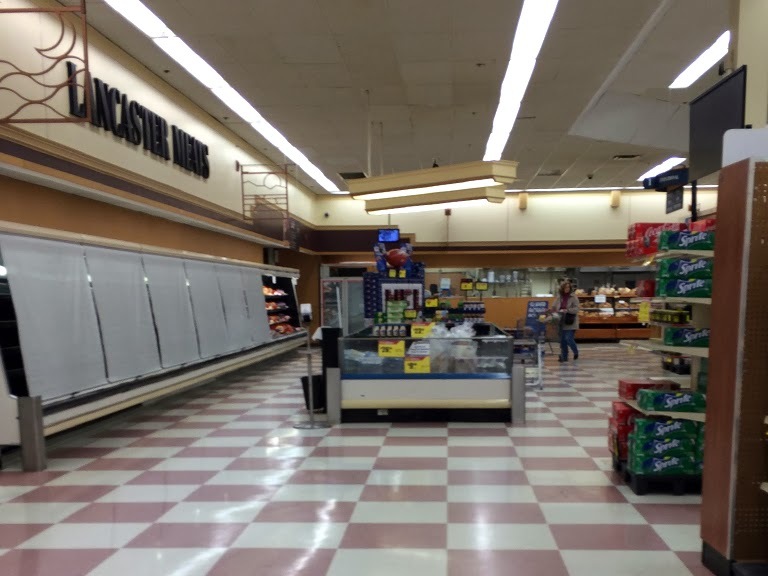 Not a great shot of the area but what you see just ahead there is a full-service pizza station! 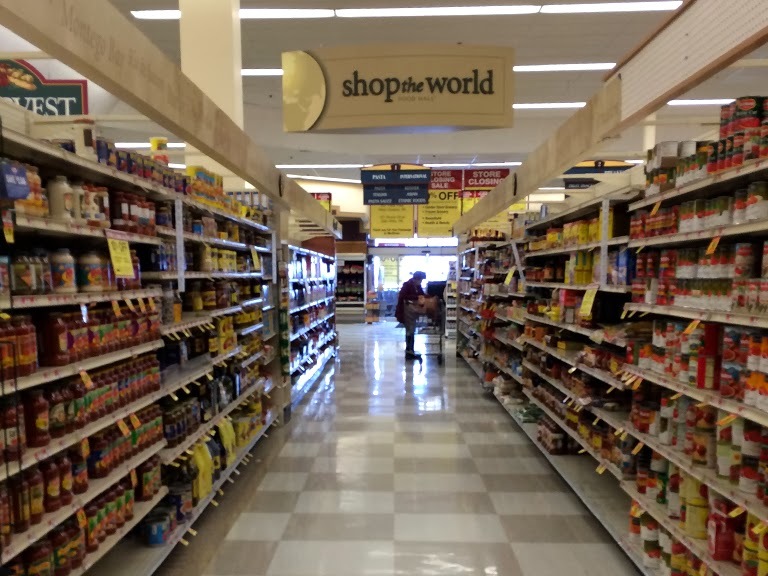 That area is normally used for the "Shop the World" shelving. 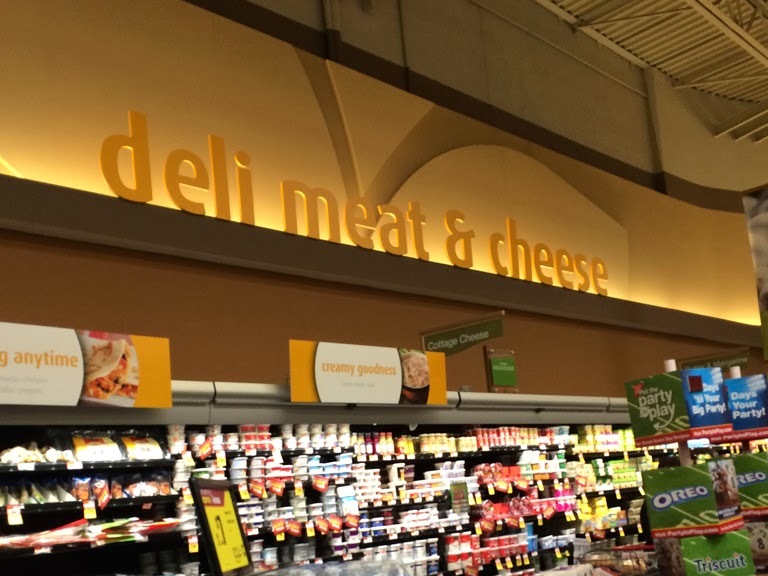 I was stunned to see pizza here. 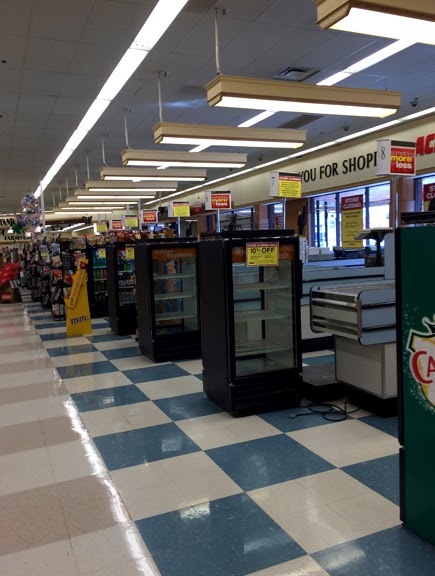 Do any other Acmes have a pizza station? I haven't seen any. As cool as this is, I did find it odd that it's located all the way at the back of the store. Wouldn't it make more sense for pizza to be right out front? 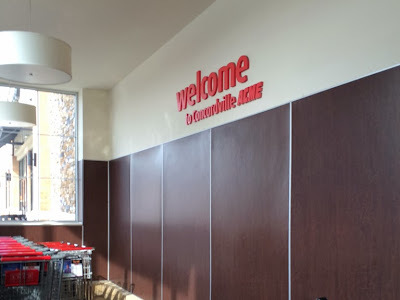 Catch those customers when they first walk in? Closer to the "cafe"?? Oh well. Still a nice feature. 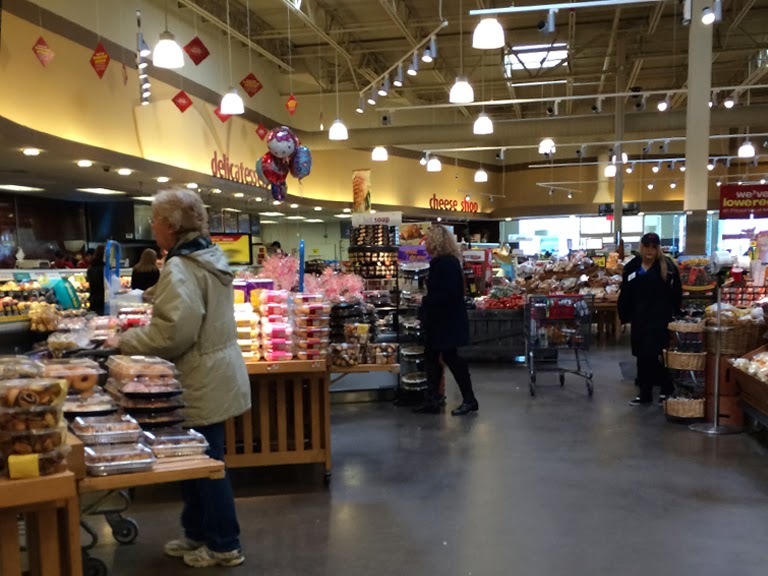 Whole Foods often has their pizza stations in the back too. One short coming of this store are all the random displays. You can see plenty here along the back of the store. 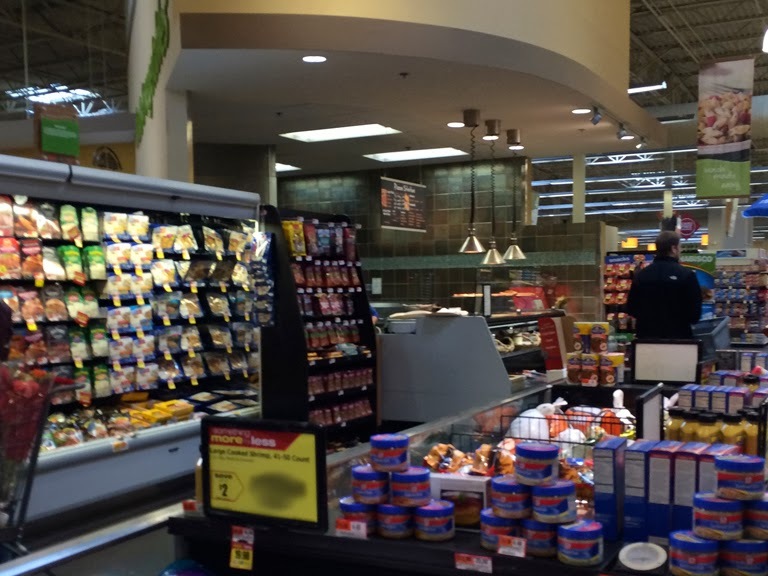 The last aisle is jam packed with them too. 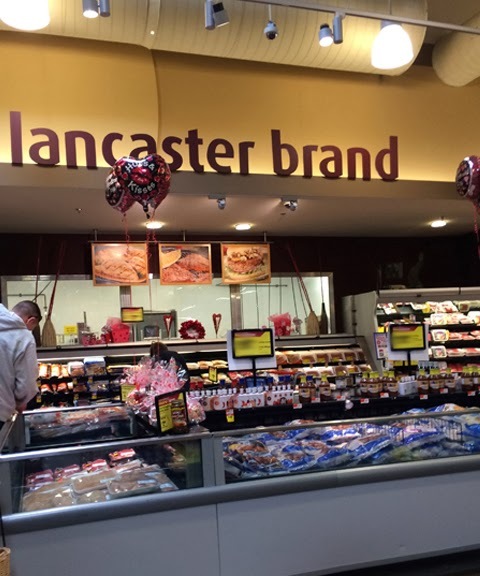 I was here SuperBowl weekend which might be the reason for all the soda and chip displays. Quick jump to the front-end. 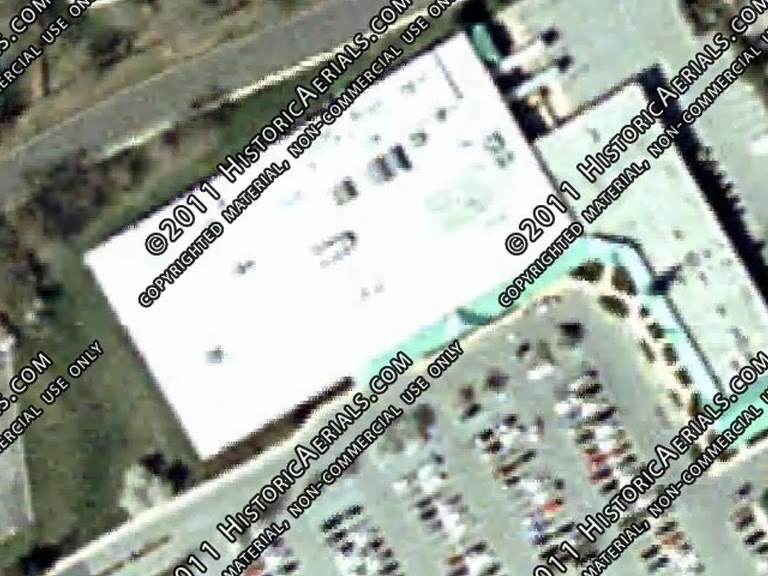 Serivce is located just past the seating area. More displays. Look across the front-end. 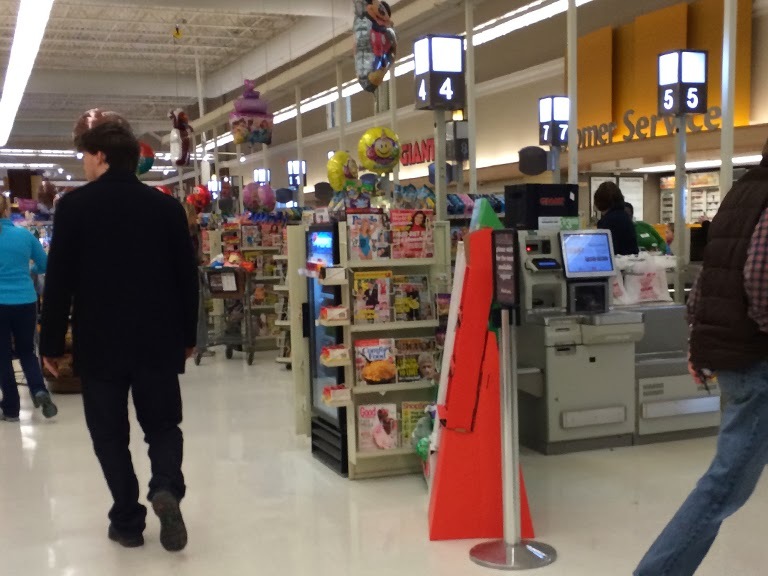 Every register was open. 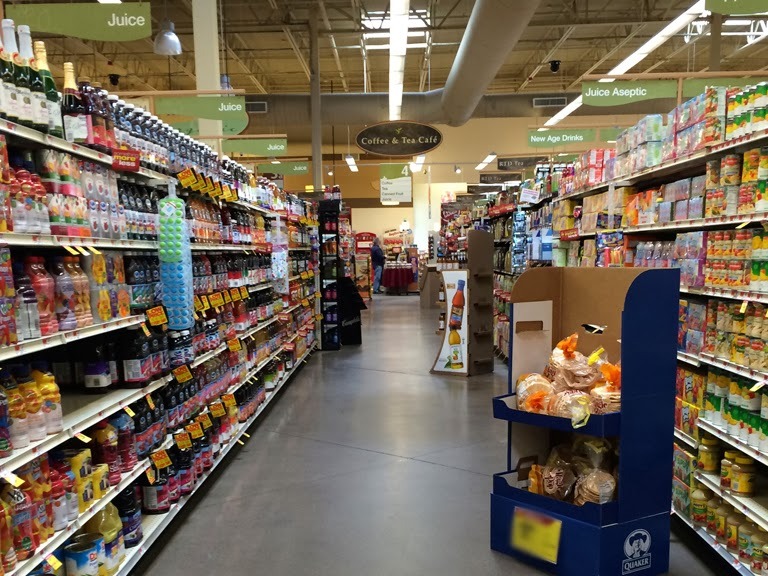 First aisle with Wild Harvest in the front and Shop the World in the back. 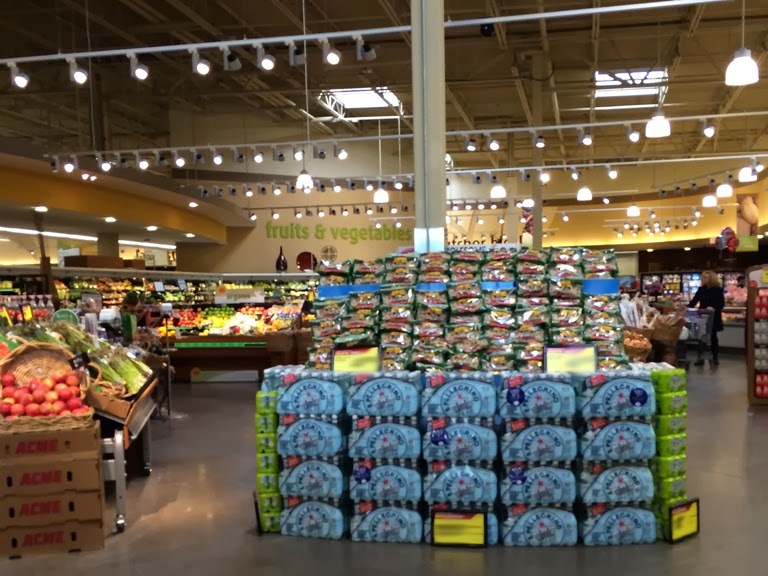 The frozen food cases on the right back up to the produce cases. 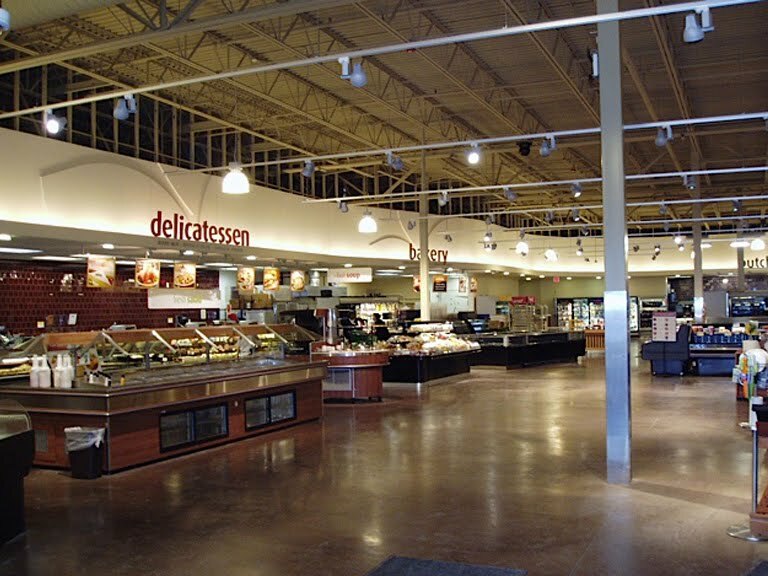 Nice lighting in this area as well, although no drum pendant lights which are often found in this area of the PF&H stores. Polished concrete floors throughout. A neutral floor like this makes for easy remodels in the future. 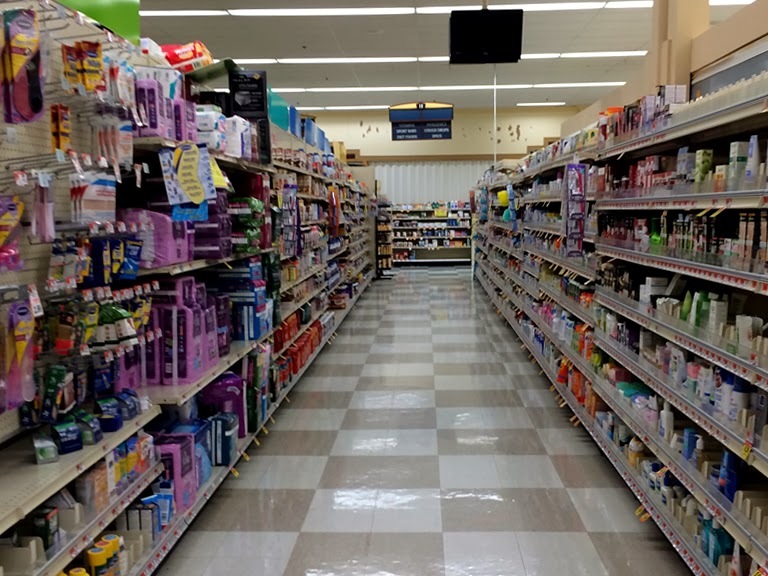 The aisles are quite long here. 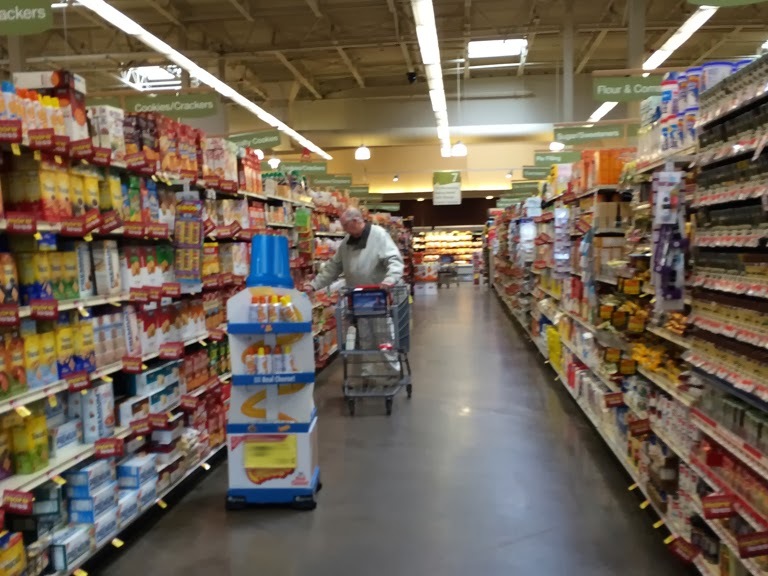 No center aisle except for a few around the Wild Harvest area. 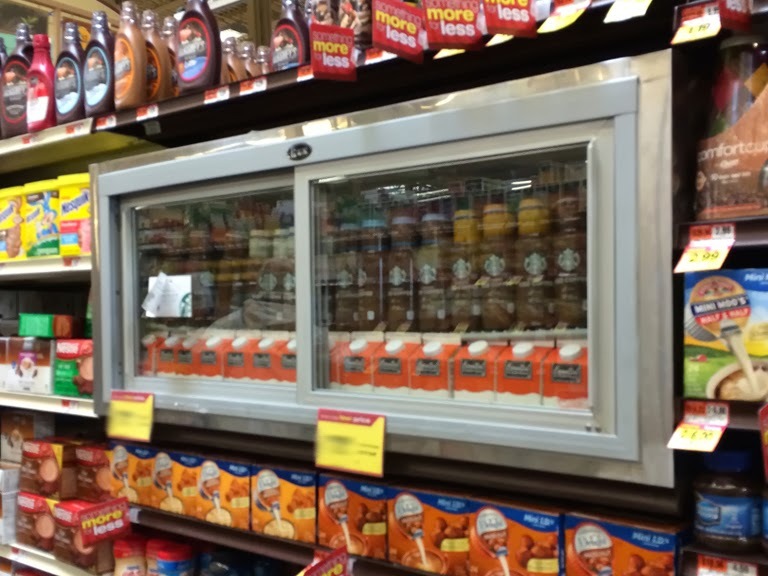 Refrigerated cream located IN the coffee aisle! 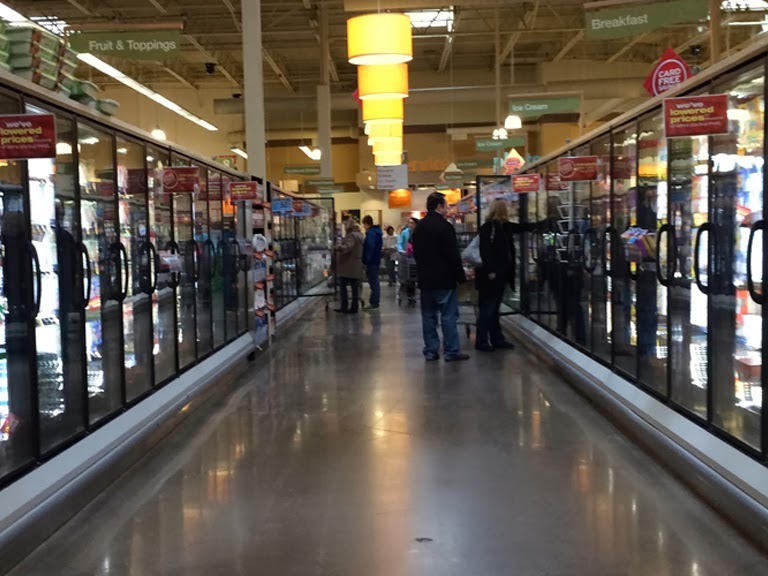 Frozen Food makes it return to the center of the store! 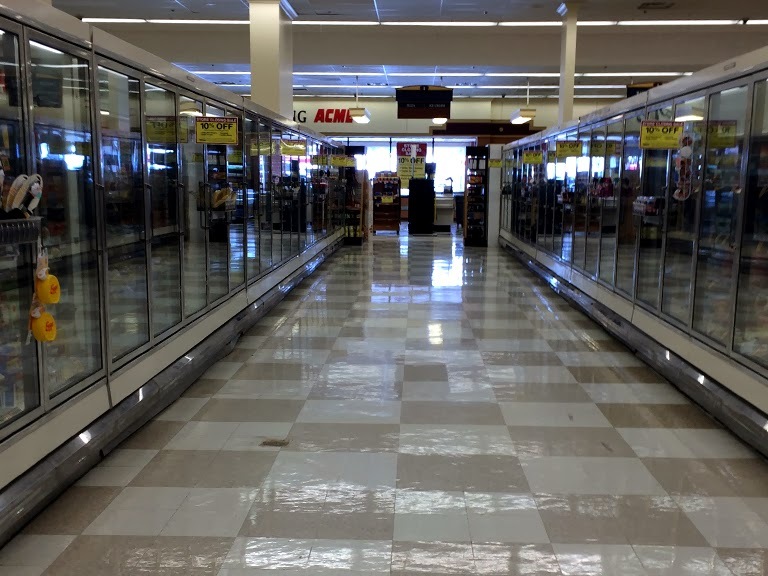 Avondale, Bordentown and Limerick all have their Frozen Food Department in the back corner running behind the Health and Beauty Aid Department. 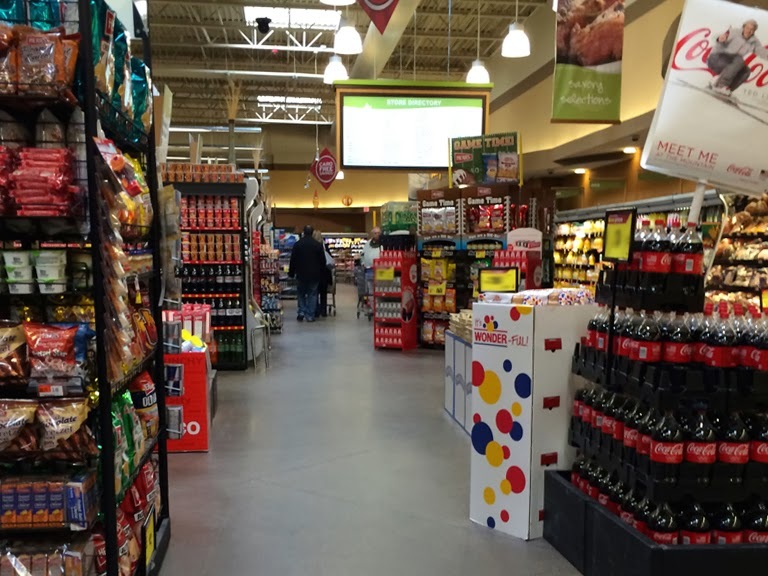 This store is 54,540 square feet and tops out at 16 aisles. 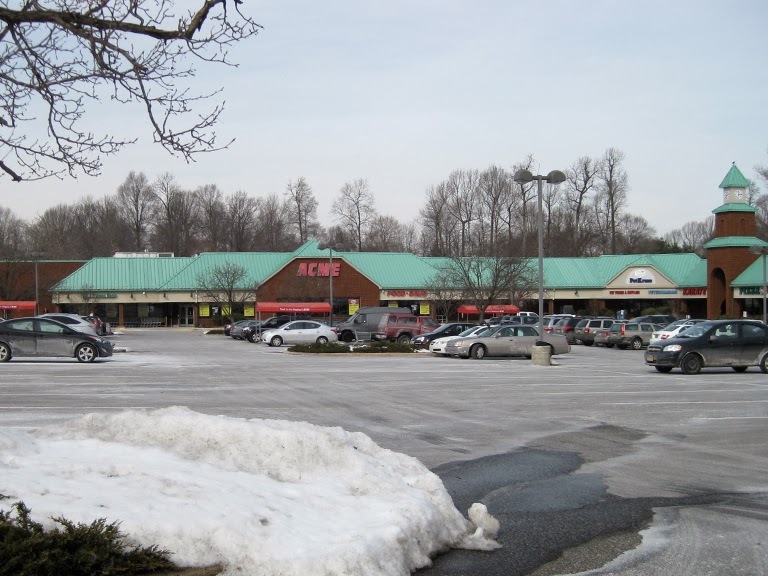 Bordentown has 18 and Limeriick, at 58,800, had 20. Another look across the front-end. 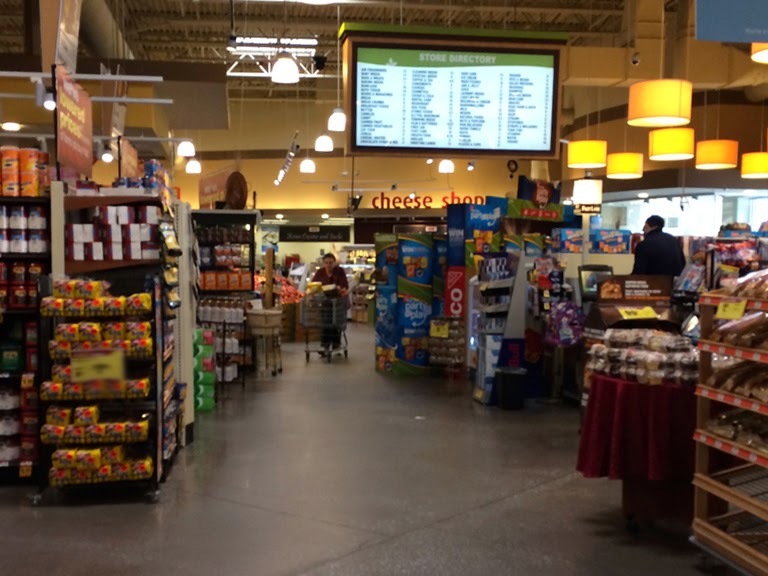 Aisle directories are located at the front and back of the store. 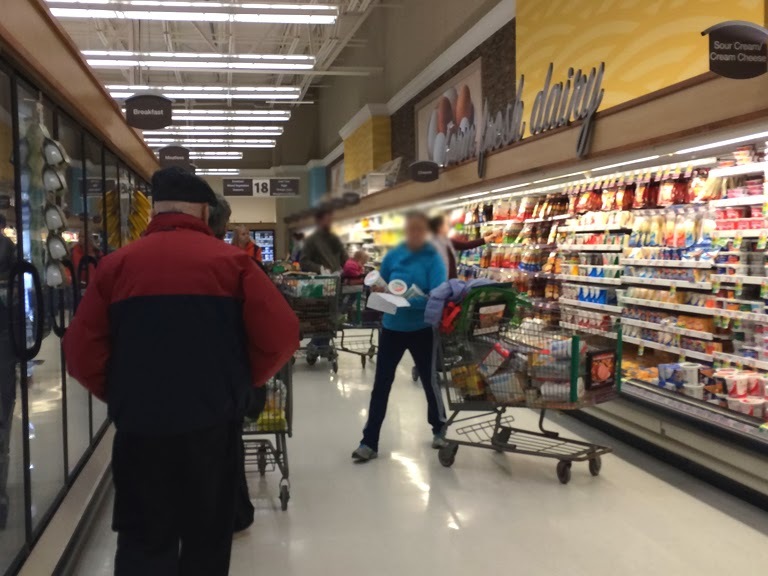 Random stacks of soda to navigate your cart around. 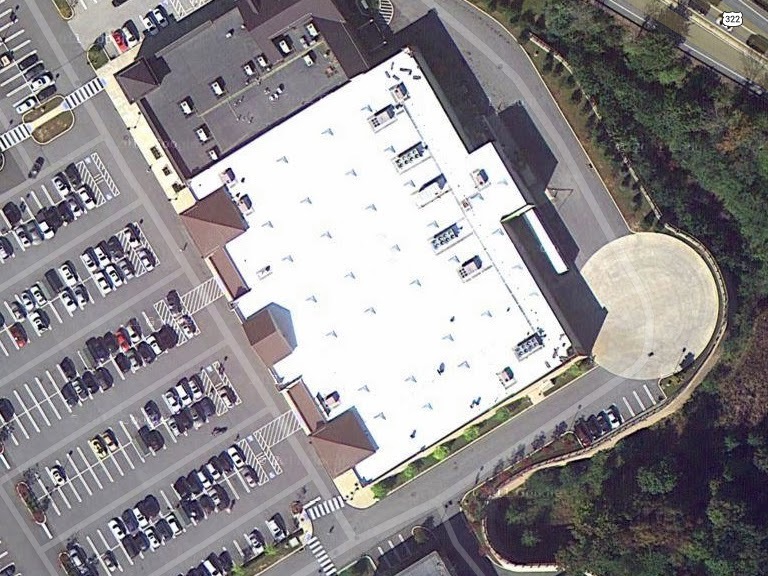 3D views are not yet available for this location so we'll just have to settle for looking at the roof. Carrying over the map from the Westtown post which showa all the competitors in the area. I've since added The Fresh Market and Costco which are both across the street from the Acme. 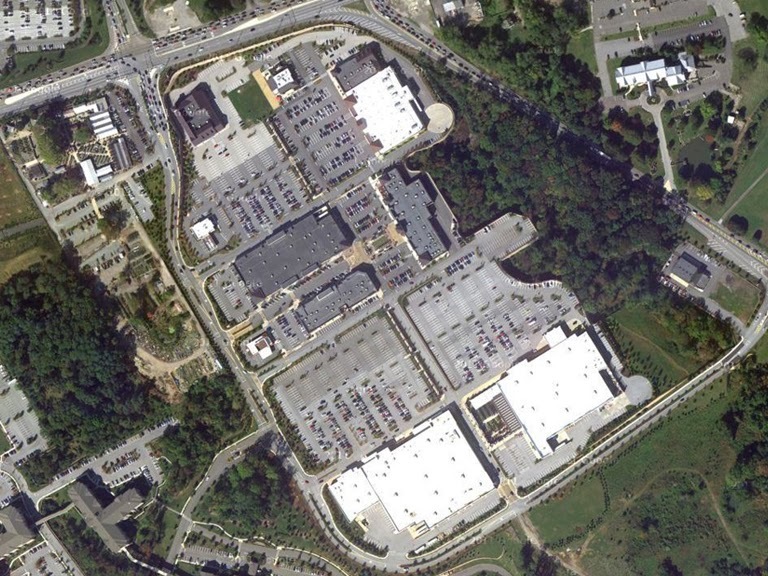 Costco is so new it's not showing up in any satellite views. Wegmans has yet to be built but approval is expected any day now. 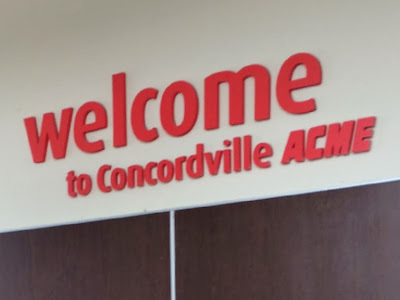 A view of the packed parking lot as we head out of the Concordville Town Centre. 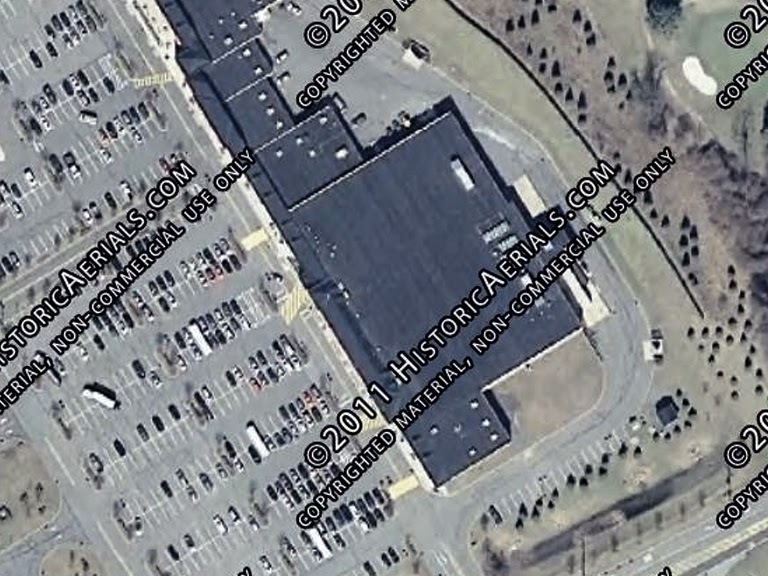 We'll be back in Jersey for the next big store post which will go up on Friday, March 7. 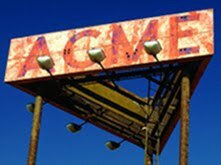 Now arriving on Acme Style, the second of the two Acmes that are closing for good next Thursday, if not sooner. 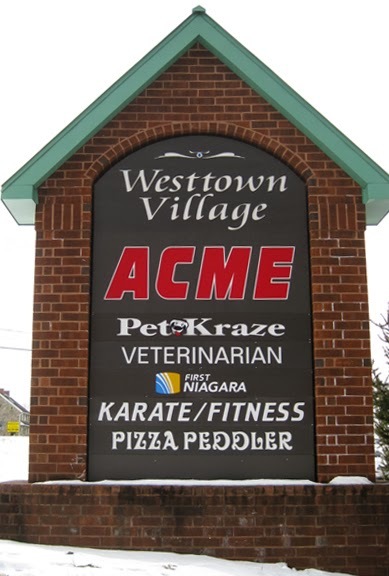 The Westtown store has been in service for about 25 years now, having replaced an older store 2 miles south on Wilmington Pike. This was a rare location that opened with the 80's remodel decor. 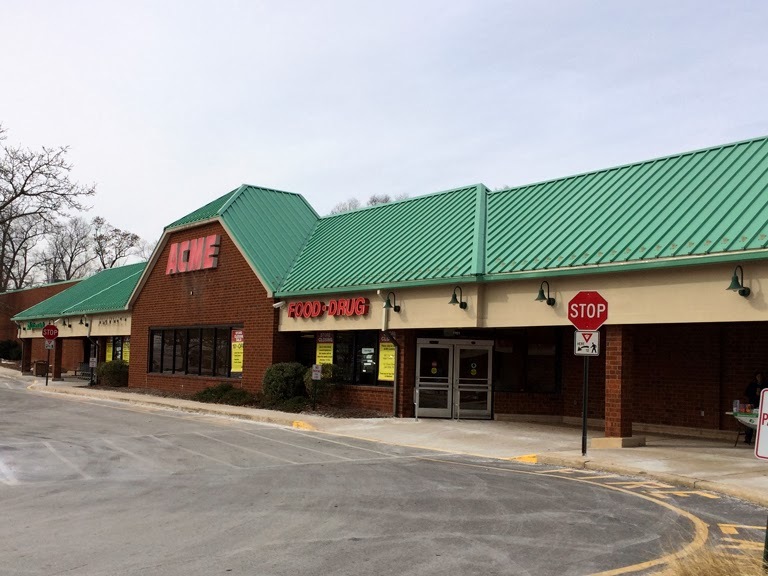 As I've mentioned before on the blog, Acme spent the mid to late 80's focusing on remodels and expansions of existing locations with construction of new and/or replacement stores at a minimum. I haven't attempted to track down all the new stores of that time but I would wager a guess at there being about ten to fifteen of them. 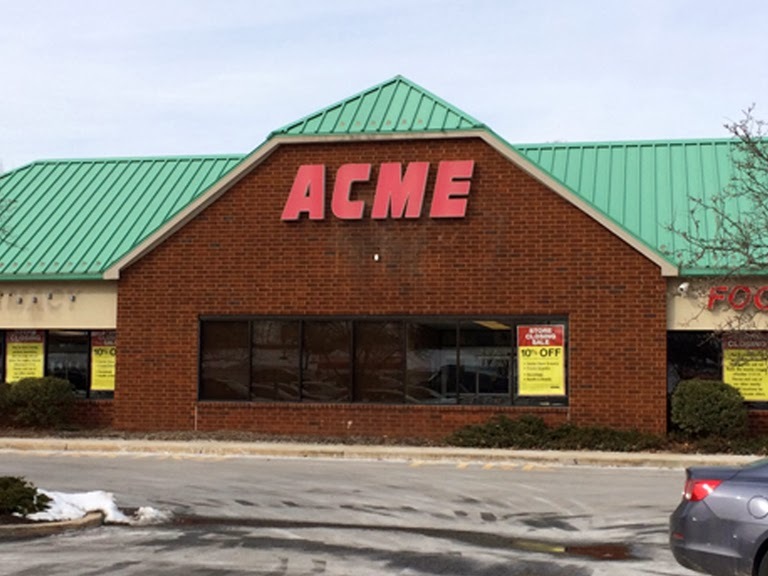 Acme would wait until the early 90's to really get serious about new store construction. 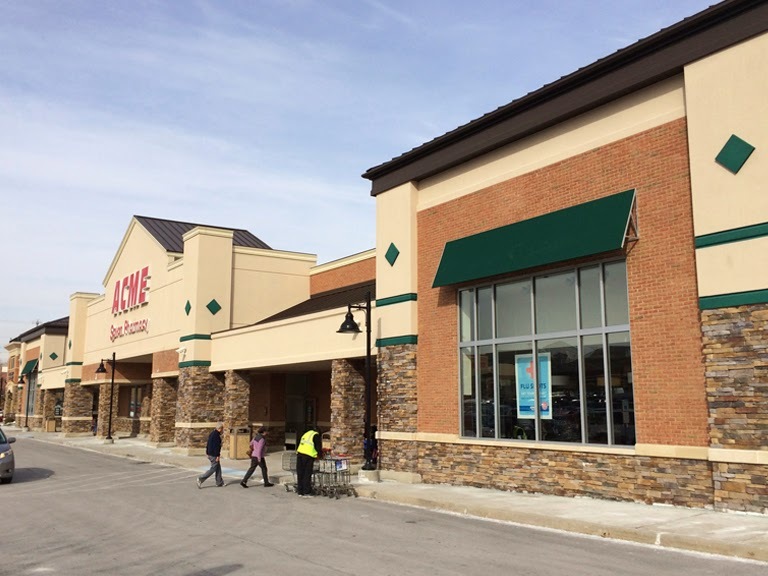 Like the store in Exton, this Acme competes with a newly remodeled Giant about a mile down the road. 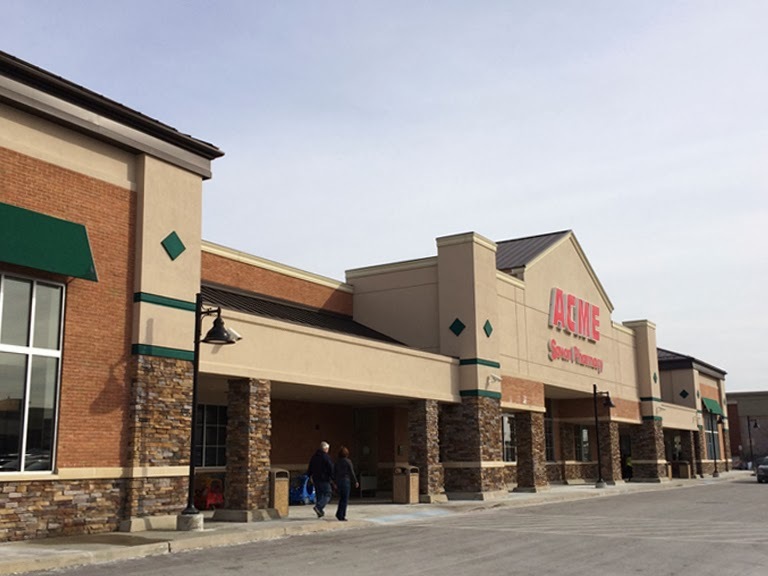 The two stores have coexisted for a little over 10 years now but the Acme has become increasingly dated during that time. 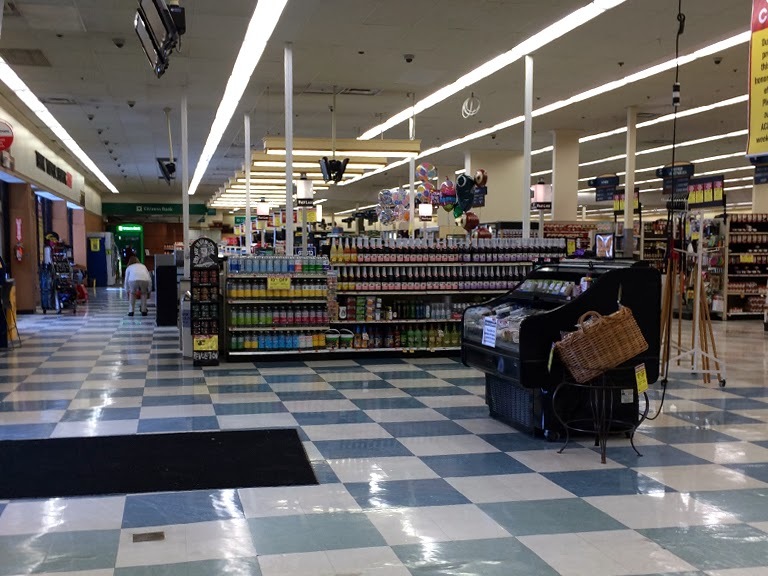 The last remodel here was the Alberstons Marketplace package with the original 80's floor left intact and remnants of the 90's Red/White/Blue remodel left behind. 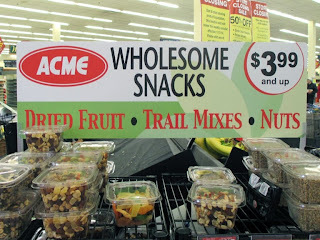 Giant's impact on business here certainly has impacted Acme's willingness to invest in the store. 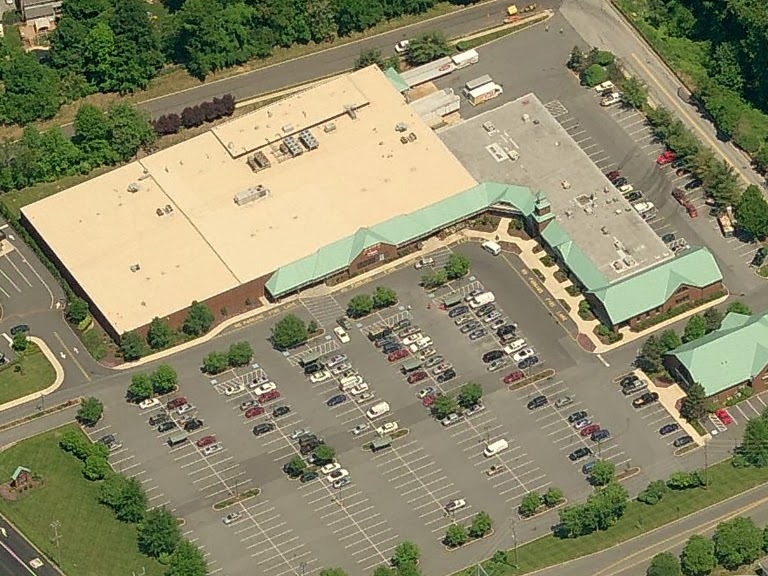 Plans for a Wegman's to be built a few miles away may also be a factor for the closing of this location. 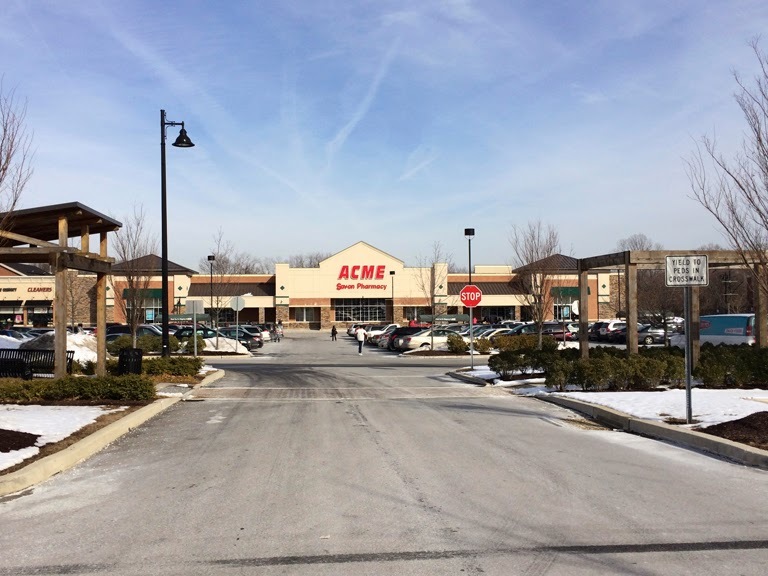 All is not completely lost here… Acme has a store a few miles north in West Goshen and a relatively new store over in Glen Mills which is actually closer to the former store this Acme replaced! 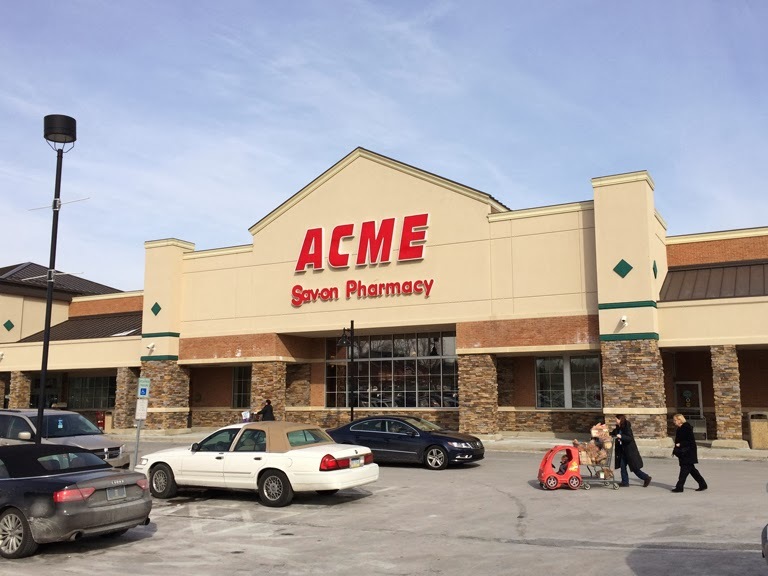 The Sav-on sign has been removed from the storefront. A scar remains from where "Pharmacy" was removed over to the left. 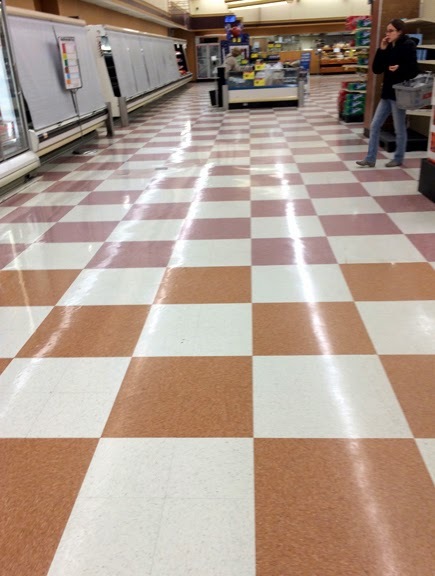 The checkerboard floor from the 80's remains alive and well here having survived two rounds of remodels in the last two decades. 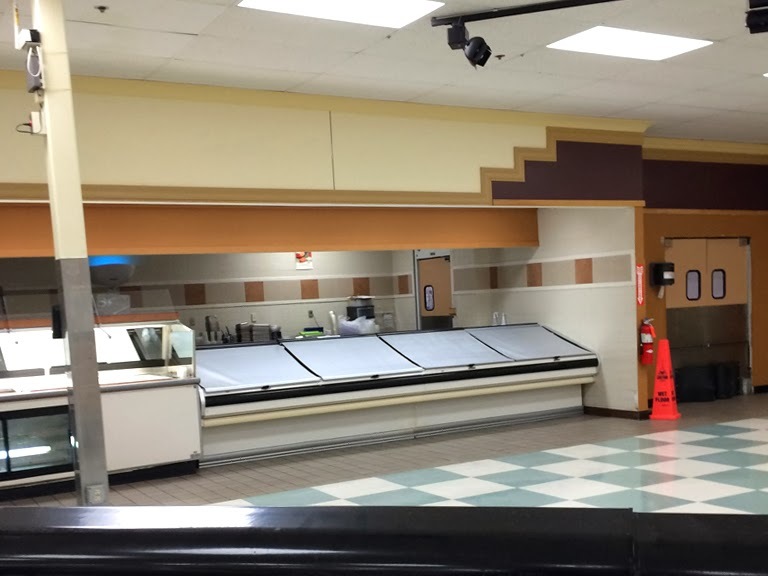 It is not a good match for the Alberstons Marketplace decor. 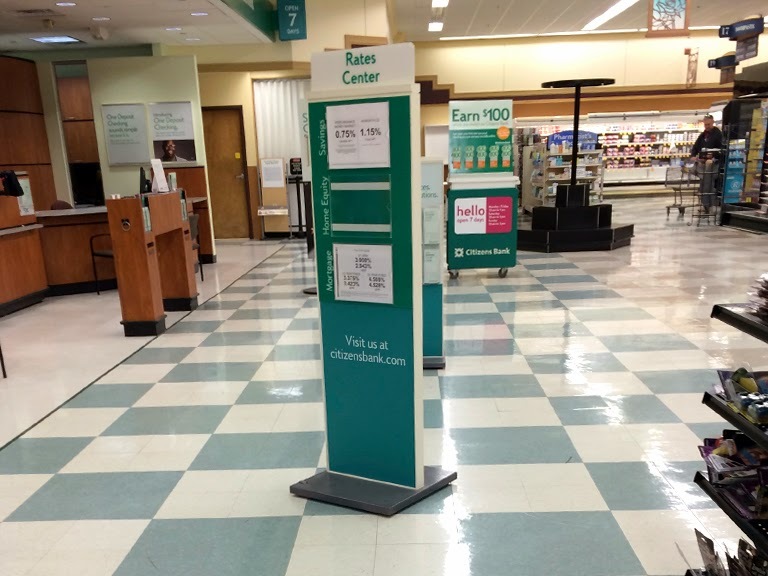 The 90's light boxes remain above the checkouts now painted a cream color. 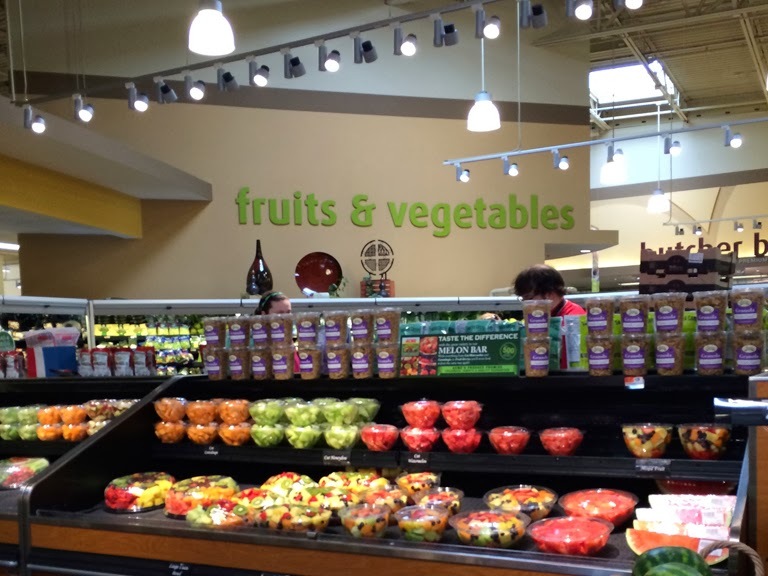 Produce is directly behind where I'm standing. 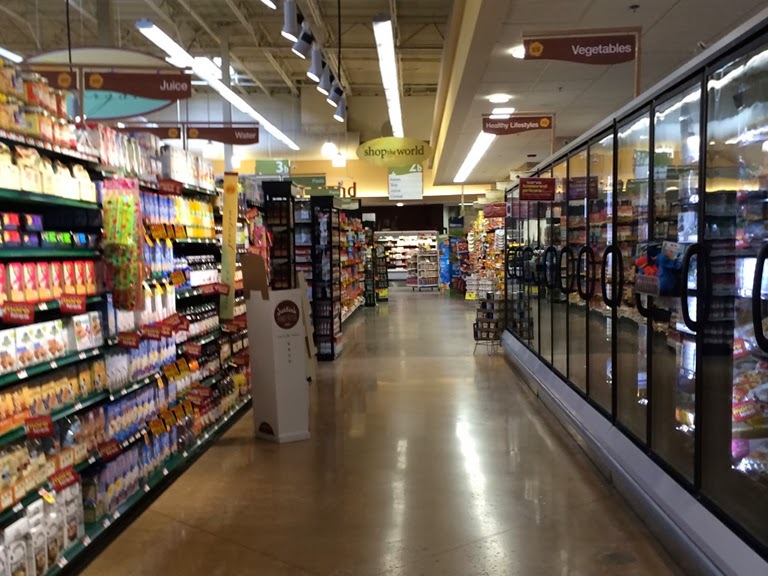 Flat drop ceiling in Produce. 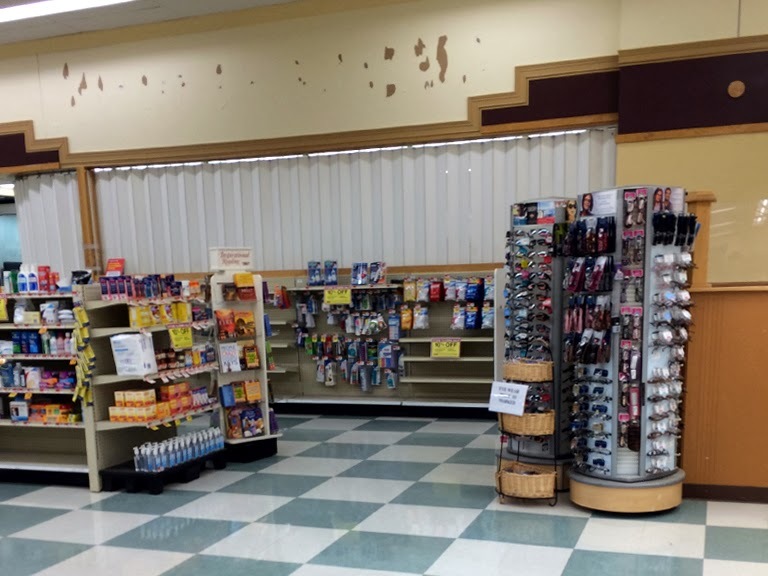 No arches or windows along the back wall like we see in the 90's stores. Wild Harvest out in the open! 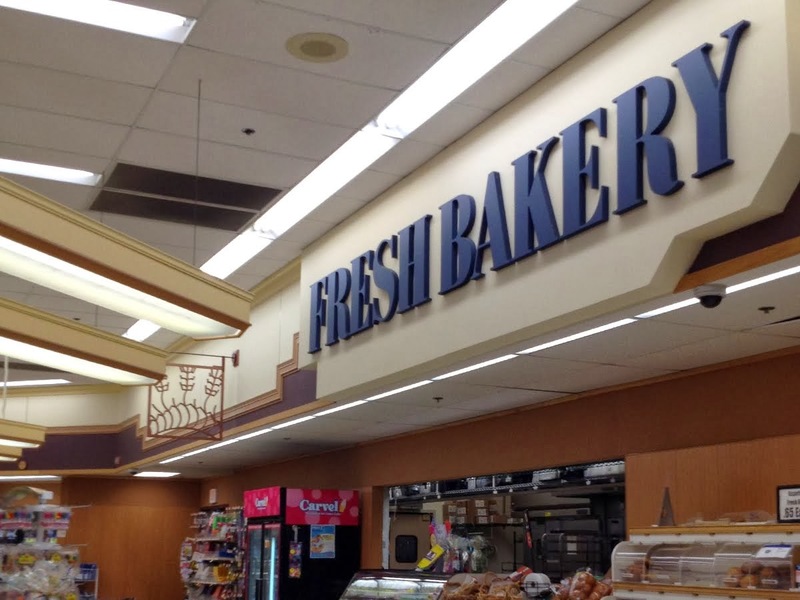 Faces the Bakery rather than being in one of the grocery aisles. 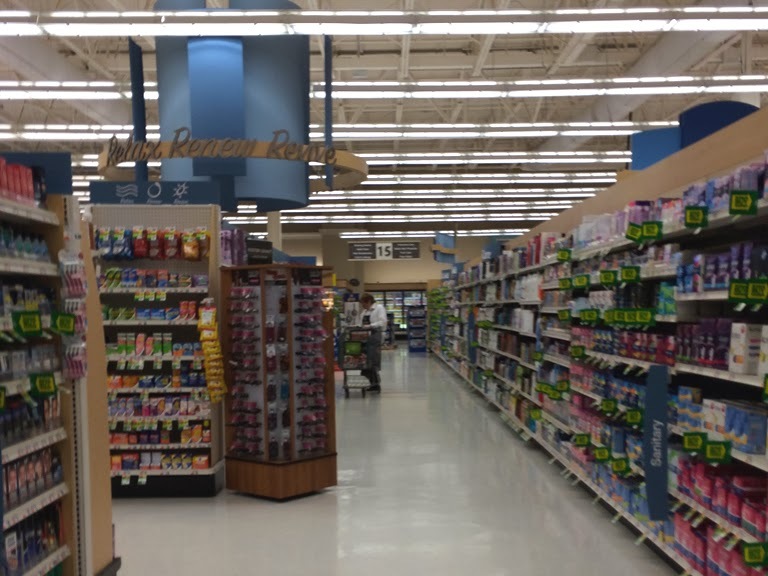 This store does not have a center aisle. A lot odd things are going on with the tile here. First off, what's up with the white section? Why a solid tan border around it? I do not know. The color of the beige tiles seem off too. It's darker than what is normally found in the 80's checkerboard floor. 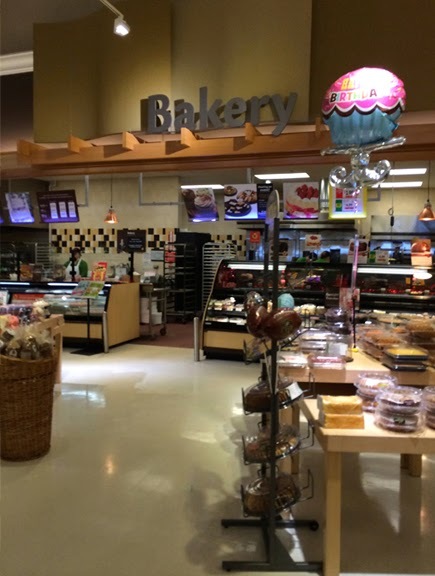 Also strange is the Bakery having the beige tiles instead of the standard gold tiles. 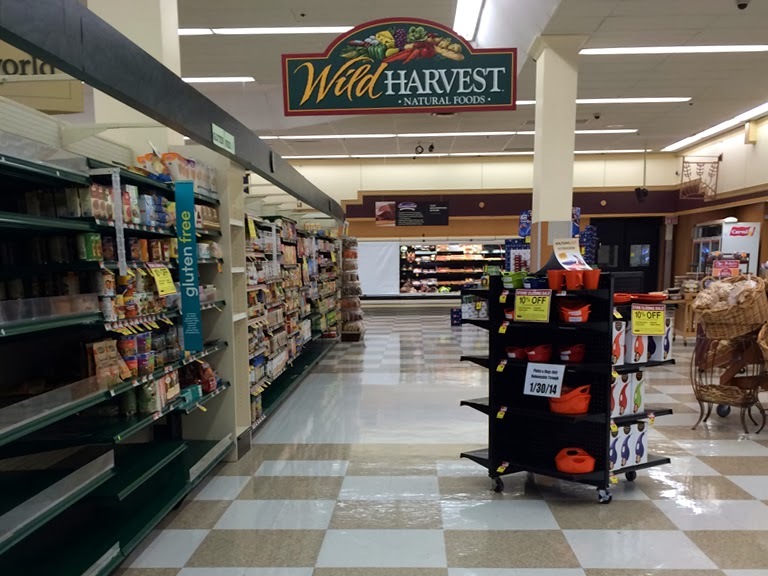 The tiles in the grocery aisles look lighter than the ones we saw over in the Wild Harvest aisle. You can also see here a solid tan line running along the left side of the aisle. Apparently something was reconfigured at some point and I want to know what it was! Off in the distance you can see a couple of key stones from the 90's decor left along the Bakery wall. Pink Meat Departmen tiles meet the orange tiles of Seafood and Deli. 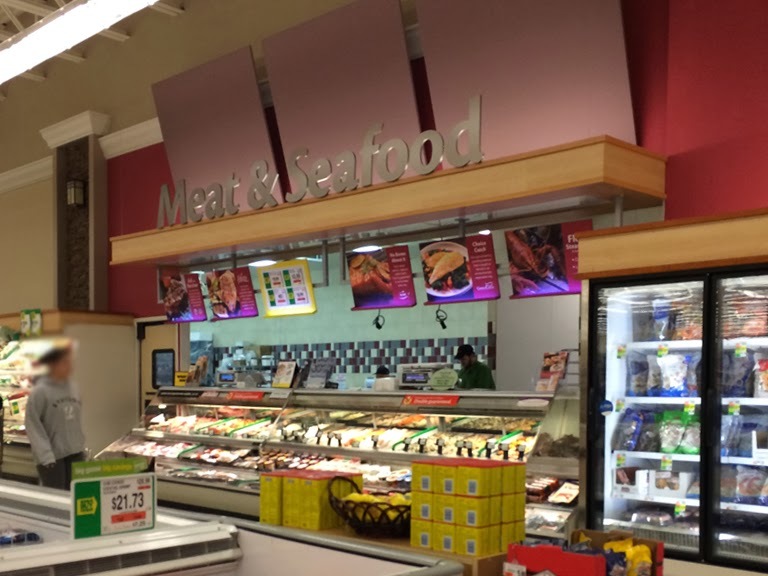 Like in the Bakery, the Seafood letters are mounted directly to the wall. 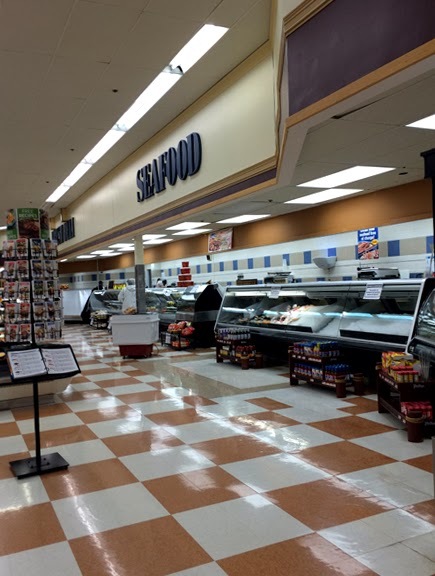 You can another odd tile configuration in front of the Seafood case. 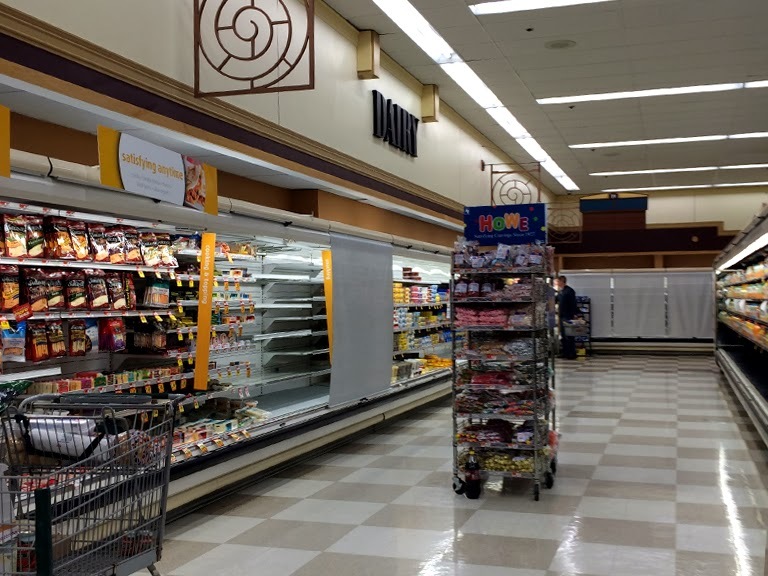 Seems like it would have been a better idea just to leave the section all white rather than tossing in some tan tiles. I'd love to know why they just didn't rip those keystones off the walls. They did in plenty of other stores. 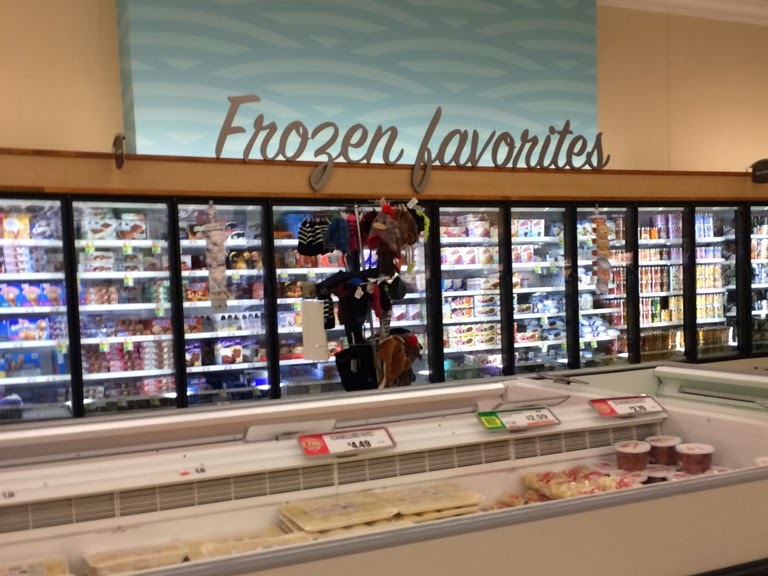 Could these be the original frozen food cases? I believe they might be. Wish I had taken a closer look when I was here. Pharmacy along the front wall with it's letters torn off. The tan tiles reach all the way to Dairy which should have blue tiles. A close-up of the Pharmacy which has the blue Dairy tiles. Looks like the bank gave to the boot to the Floral Department, if there ever was one in the first place. 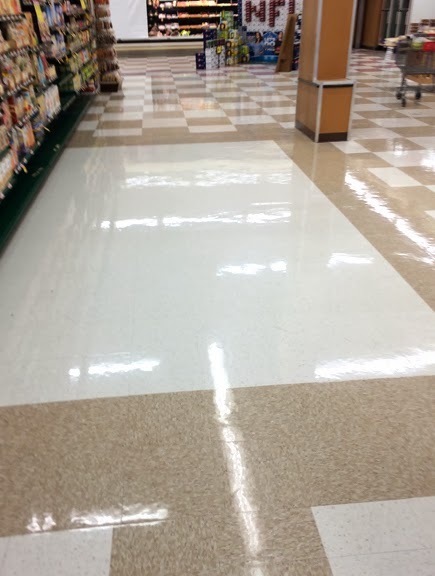 Notice the tiles cut at an angle on the floor. Similiar to the angled ceiling above. 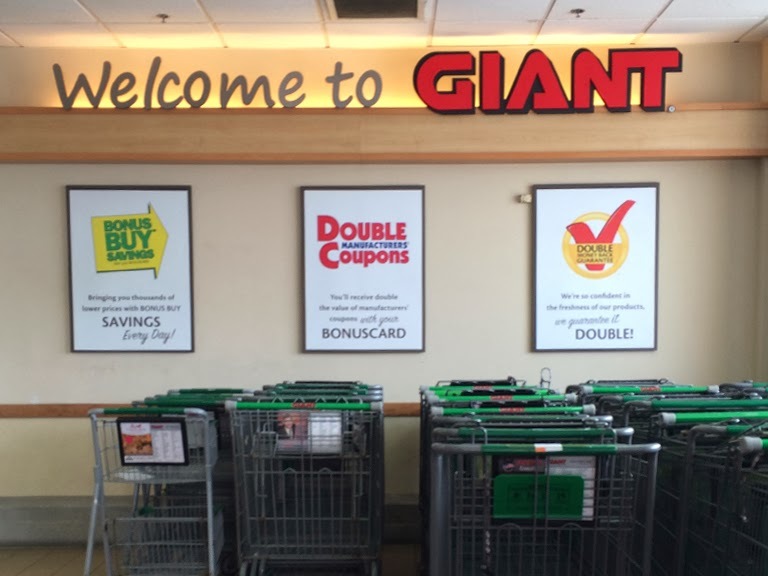 Even with the discounts there was hardly a customer to be found. 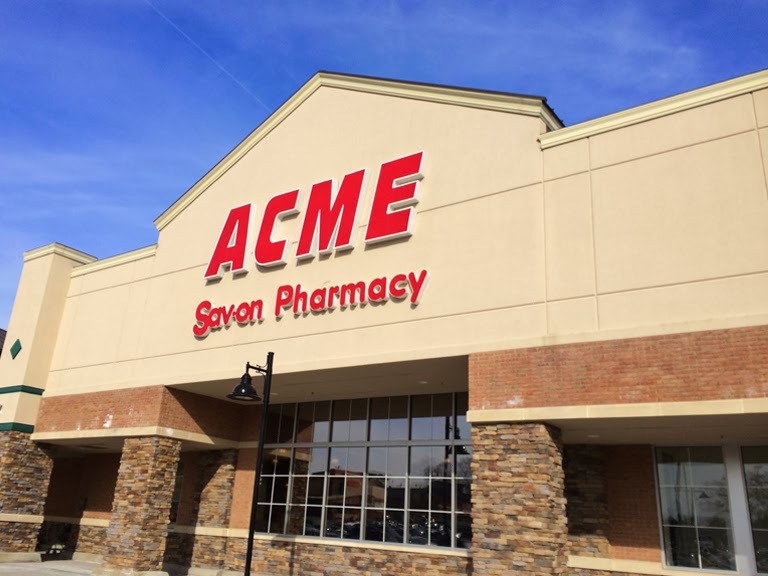 The other stores are sure to take a hit when the Acme closes. 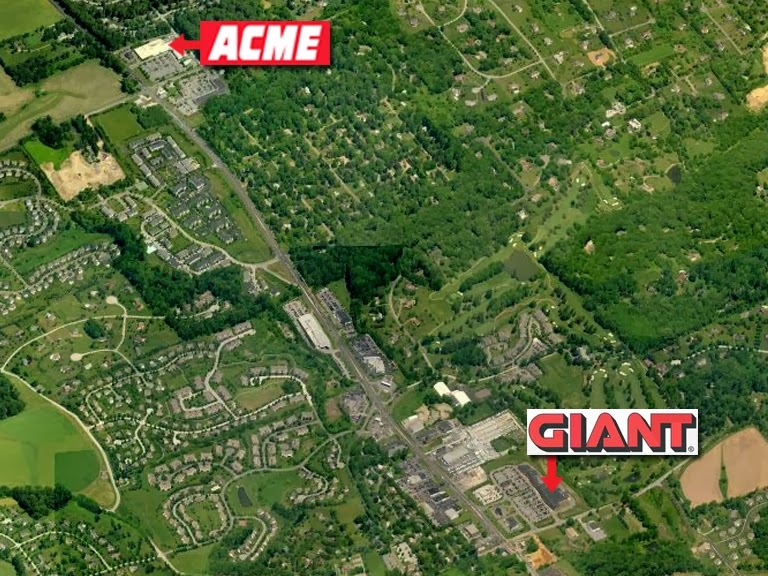 Let's take a quick trip down the road to check out the Giant! We'll take a very quick tour of this store. 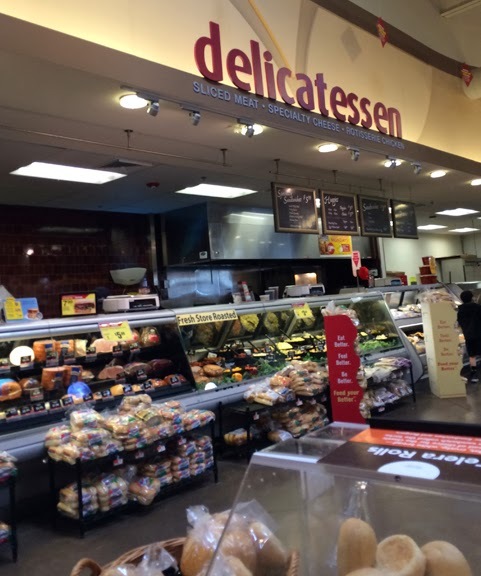 It's very similar to the one in Exton. 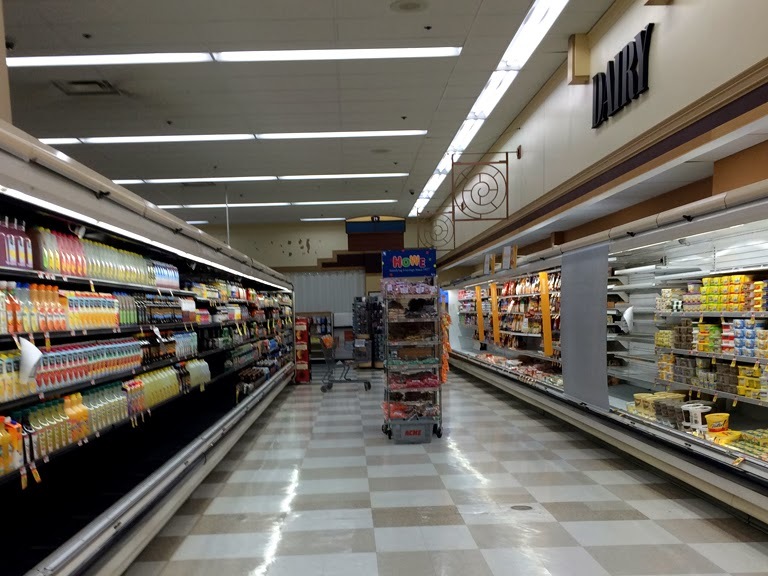 Even has the Beer department in the front, which I did not snap a picture of. 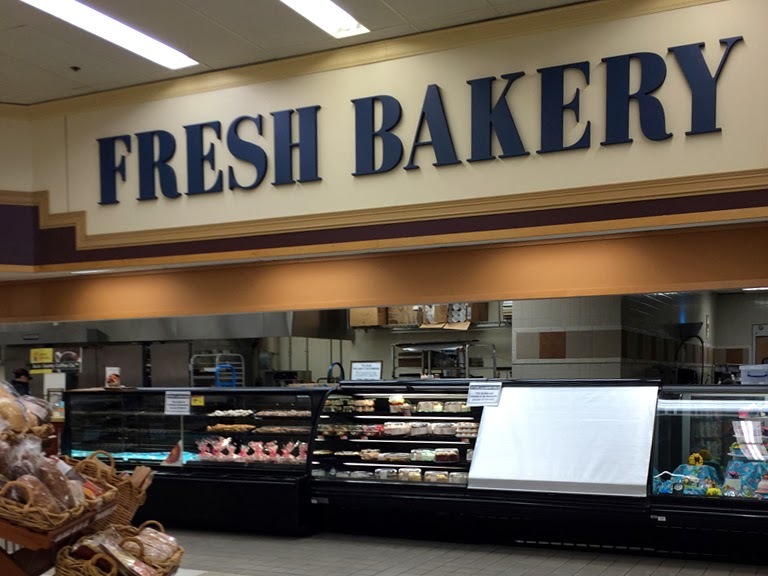 That's some bad lighting on the Bakery sign. This place was slammin' busy! 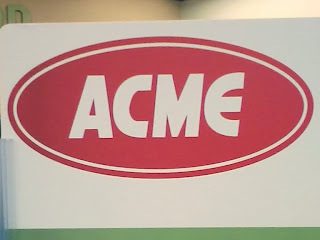 The original Acme, as pointed out with the red oval logo, stood where the AMC theaters are now. All indications are the building was torn down. 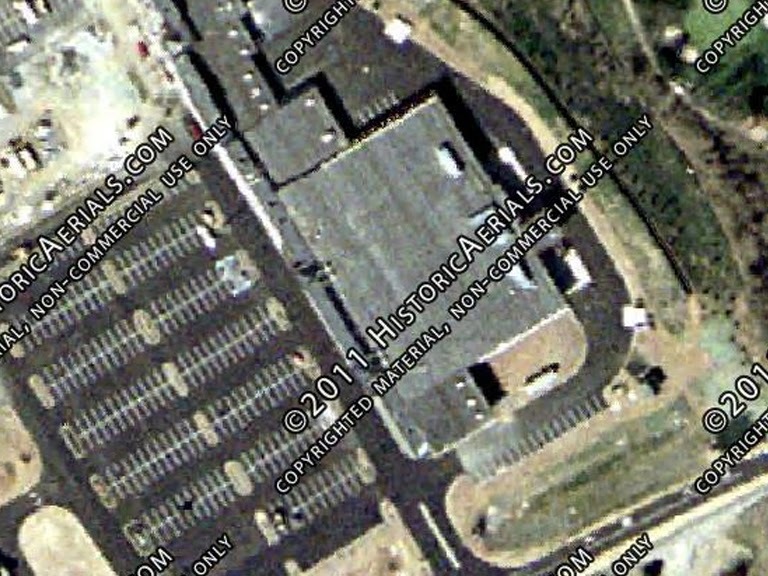 According to the historic aerials, the store arrived after 1971 and was gone by the next available aerial in 2002. 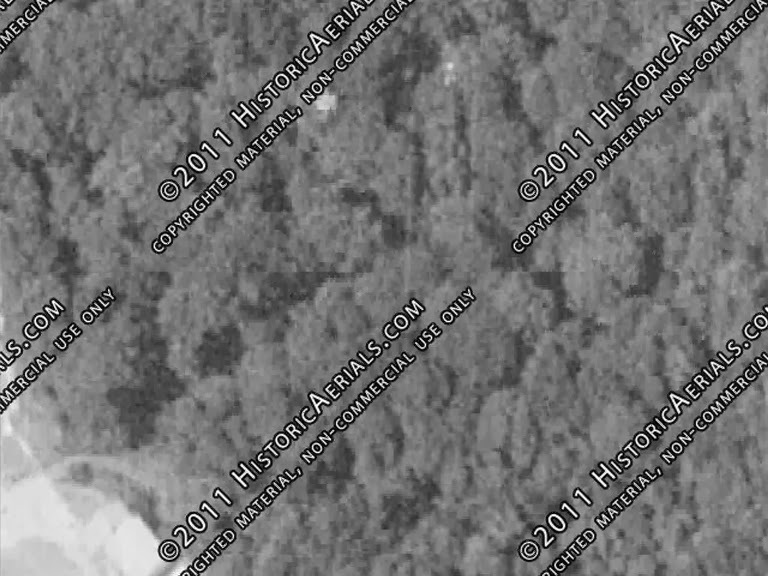 Unfortunately, no available historic aerials show the store. 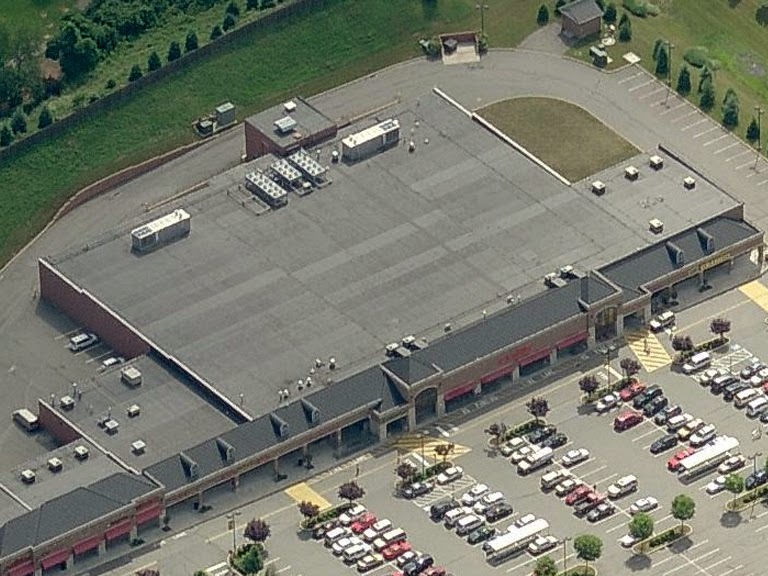 The Acme on the right side of the image is the Glen Mills store, not yet standing when this aerial was taken. 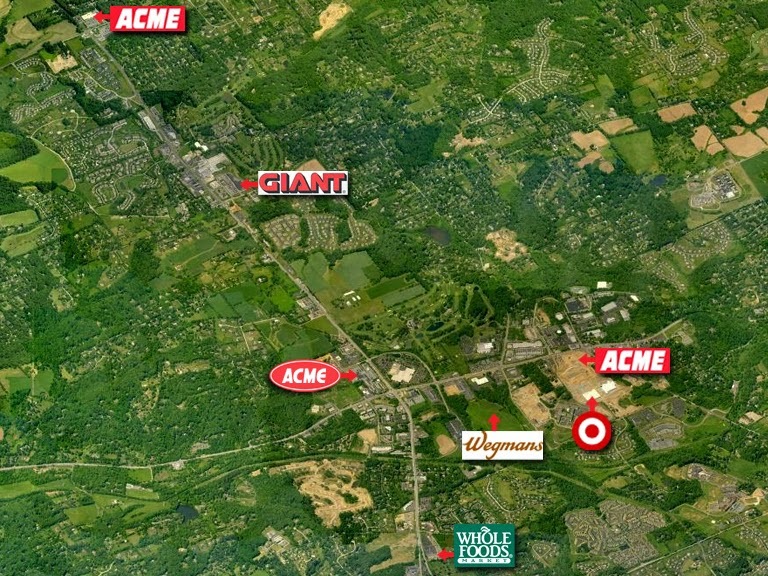 Wegmans is planning to build approximately the area where you see there logo. 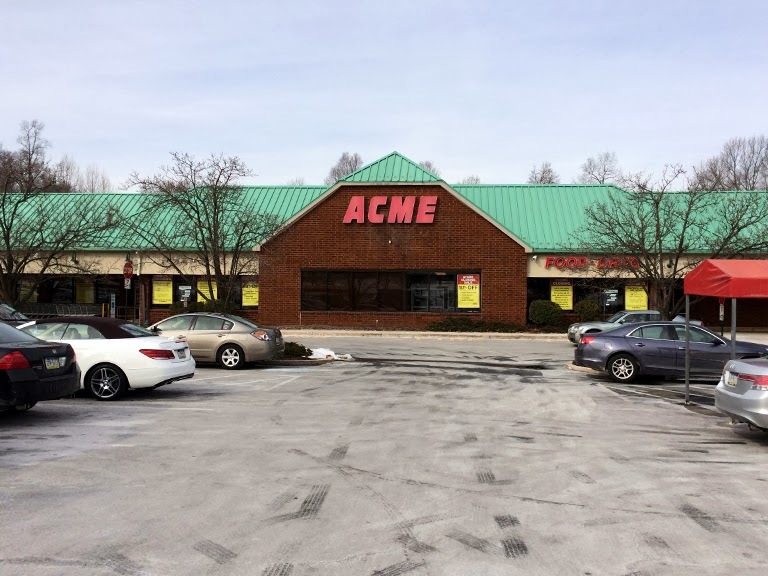 With coverage of both the closing stores now out of the way, we'll switch gears for next Friday's post and visit the hugely successful Acme over in Glen Mills!